I want to begin my presentation by talking about interface. A couple of years ago I presented a keynote at a digital humanities conference on digital editing in which I made the argument that data for a project should take precedence over the interfaces used to present that data. (I stole this idea from my colleague Doug Emery, and I liked it so much, I had it put on a teeshirt). In my talk today I want to investigate how data and interface work together, how existing interfaces can influence both the data we gather and the development of new interfaces, and some ways that we can think around existing interfaces to develop new ones (and what this in turn means for our data). 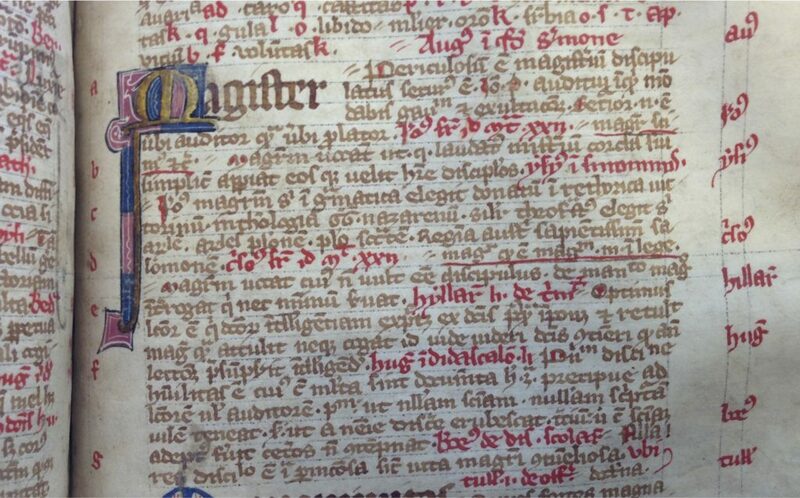 This is MS 433, a Miscellany copied in a number of hands from the 13th into the late 15th century. 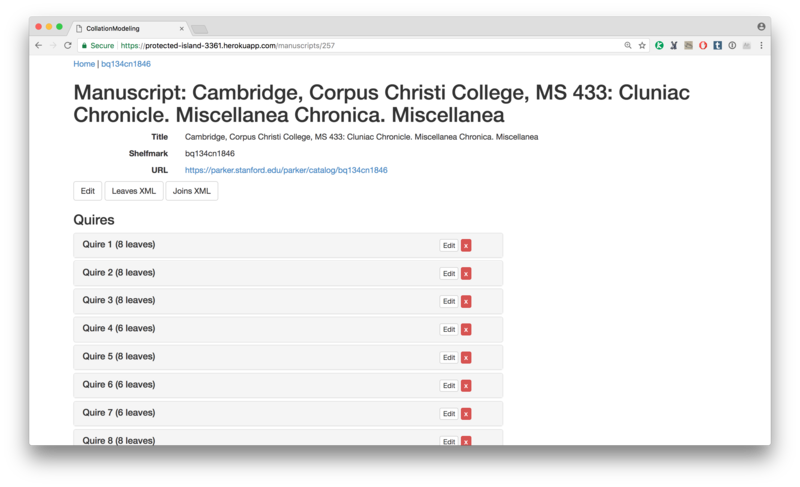 If you want to see this manuscript, you have a few different options, which you can access through the menu in the top right. 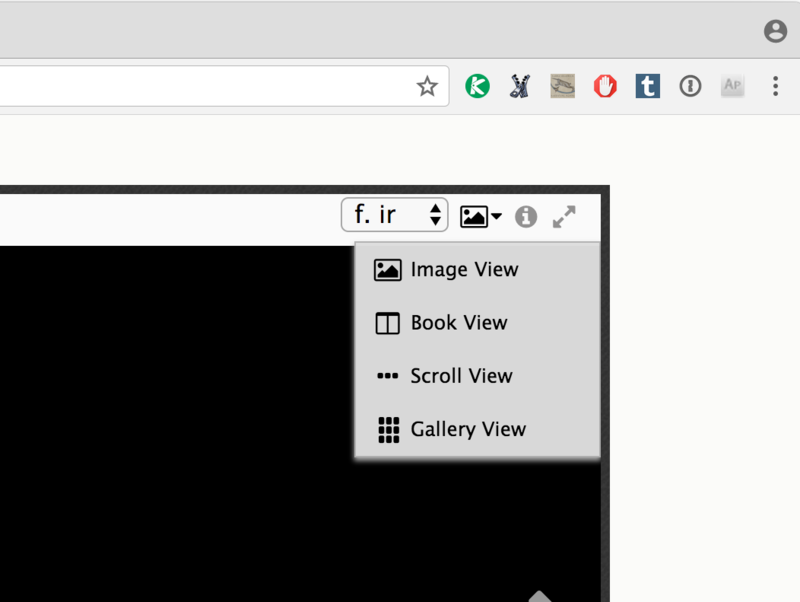 The options are: Image View, Book View, Scroll View, and Gallery View. You probably know exactly what you’ll get when you make a selection here: Image View will present you with a single image, Book View will show the book openings, also known as facing pages (as Dr Anne McLaughlin said in her introduction at the Symposium, Book View presents the images “as a book, so when I turn the pages, it looks like a book”), Scroll View will show all the page images in a continuous row that you can scroll through back and forth, and Gallery View will show all page images as thumbnails in a single page. Each of these views serves a different purpose: Image View, Book View, and Scrolling view present the images in a size large enough to read, with slightly different methods for moving through the book, while gallery view is more like a finding tool that also gives you the ability to get the “sense” of the aesthetic contents of a book: the relative size of script and written area, distribution of illuminations or miniatures, that kind of thing (as Anne said in her introduction, in this view you can “look at the whole thing – look for initials, for something pretty to look at”). You wouldn’t read a text in the Gallery view, you would select an image from that view and then interact with that larger image (clicking on a thumbnail in the Gallery view on Parker takes you to the Image View). I want to consider for a moment why we present digital manuscript images in these ways. Let’s start by looking at some examples of non-digital manuscript facsimiles. For example, here’s an opening from the 1933 Early English Manuscripts in Facsimile facsimile of the Exeter Book. The pages face each other in the manuscript (this is 65b and 66a), but they’ve been decontextualized, presented in frames and with labels underneath. Compare this with the Salerno Editrice edition of the Peterborough Bestiary, published in 2004, which looks very much like what I imagine the manuscript looks like (I haven’t seen it so I can’t say for sure, but it definitely looks like a manuscript, unlike the Exeter Book facsimile, which looks like pictures of pages reproduced in a modern book). 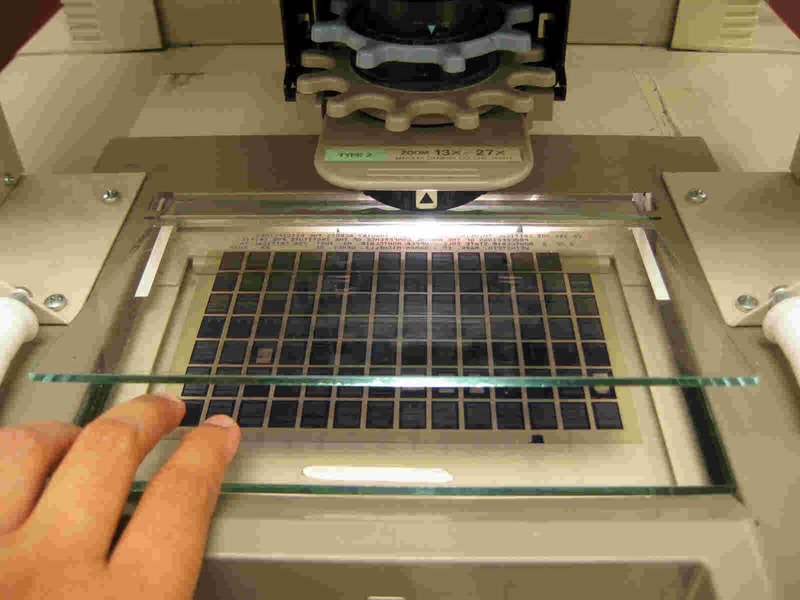 And here’s something that is probably familiar to many of us: Microfilm, which presents images on a long ribbon of film, which you scroll through a special machine to find whichever page you want. Finally, there’s Microfiche, which consists of rectangles of film onto which small images of pages are presented in a grid. I expect you can see where I’m going with this, because I’m not exactly being subtle. The options for viewing manuscripts in Parker on the Web are basically the same as they have always been. The difference is that instead of having to go to a library to check out a book or access a reader (or order a book through interlibrary loan, if your library doesn’t own it), that you can access them in your office, or at your house, at all times of day (as long as your Internet is working, and the system isn’t down). 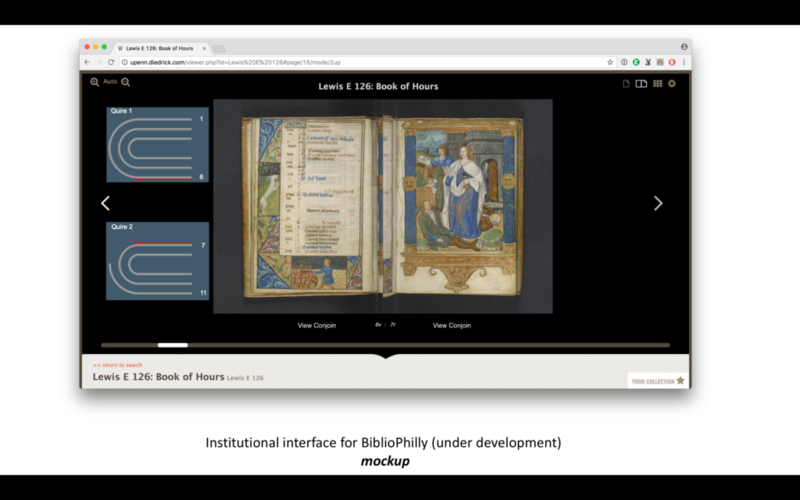 It’s not just the Mirador Viewer (the interface that provides image access in Parker on the Web) that has these options, every online environment for viewing medieval manuscripts will have some similar setup with at least a page-turning interface and frequently a selection of the other three. E-codices is the only interface I know of that has another option: to view the front and back of a leaf at the same time, which is pretty cool (The Scroll View also shows the front and back of leaves side by side, but in e-codices you can purposefully select this view. If you know of any other interface with unique views I would be very happy to know about them). 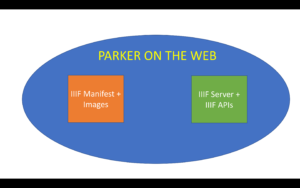 Parker on the Web, for example, is a IIIF system, so in order to function it needs IIIF Manifests, which provide metadata in a specific format in addition to links to images served in a specific way, and it needs the IIIF server to serve the images, and the IIIF APIs (or more properly, software built to work with the APIs). If any piece of this system doesn’t meet specification – if the manifest is formatted incorrectly, or the image links don’t point to a IIIIF image server, or the software doesn’t reference the APIs correctly – the system won’t work. Without both data and processes – data and processes designed to work together – you won’t have a working system. 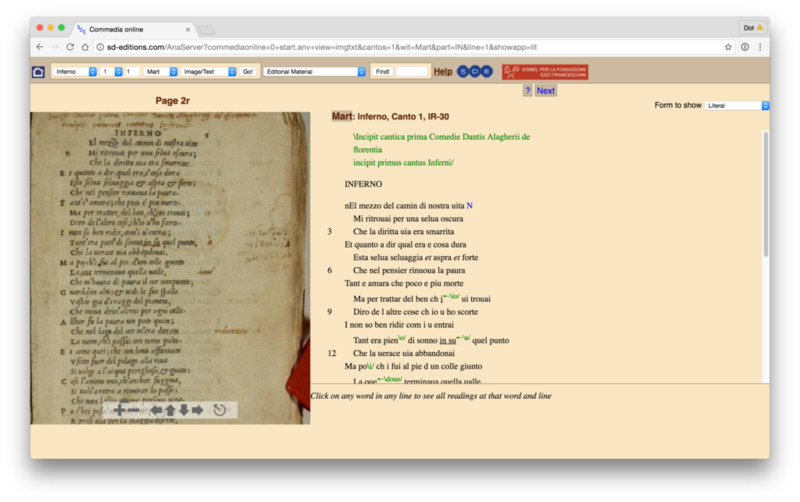 I’m interested in creating new ways to present digitized manuscripts, and the frame I’m using is that of the manuscripts collation. 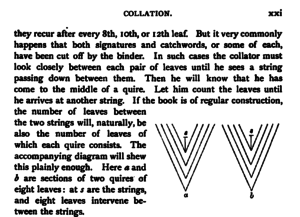 Rather than displaying a digitized manuscript only as a series of images of pages arranged from beginning to end, I want to create displays that take into account pages as leaves connected to each other through the pattern of the quiring: the collation. Collation isn’t a new way to think about manuscripts. 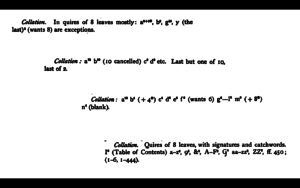 In his 1895 Catalog of the Fitzwilliam Museum, M. R. James wrote a description of how to collate a manuscript, and also included collation formulas in most of the manuscript descriptions (a few random examples are in the figure below). The Parker on the Web also includes collation formulas. Building a system that considers a manuscript’s quiring in the display should be possible. We have the information (in the form of collation formulas), so we should be able to build processes to act on that. But of course it’s not that simple, because although a collation formula contains the information a person might need to construct a diagram of the codex, it isn’t formatted in a way that is able to be processed by a computer. It’s not an effective piece of data for a system of the type I describe above. 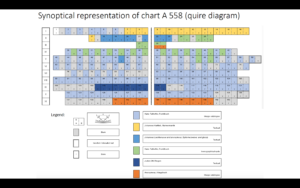 The collation formula isn’t data, it’s a visualization of data, just one way to express the physical collation of a manuscript among many possibilities, and which visualization you choose will depend on what you want to do with it. For example, formulas work well in library manuscript descriptions or catalog records because they are compact and textual, while diagrams might be better suited for a scholarly essay or book because they can be annotated. There are other views one could take of the same information; I’m quite fond of this synoptic chart that shows how different texts and image cycles are dispersed through this miscellany. However it takes work (both time and effort) to write formulas and draw diagrams and build charts. This is labor that doesn’t have to be repeated! What we need isn’t a formula, but a specially formatted, data-oriented description that can be turned into many different versions for different purposes. This is where VisColl comes in. Briefly, VisColl is a system that consists of a data model, which is basically a set of rules, that you can use as a guide to build collation models of manuscripts, and then scripts that you can use to process the collation model to generate different views of that model. We currently have three working scripts: one that generates diagrams, one that generates a presentation of leaves as conjoins (which we call the bifolia view – this view requires digitized page images) and one that generates collation formulas. We are currently at an in-between stage with VisColl. We had a first version of our data model, and we have developed a second version but that one doesn’t have good visualizations yet, so today I’m going to talk about our first model, but I’m happy to answer questions about the second data model later. The prototype of VisColl took collation formulas from The Walters Art Museum in Baltimore’s Digital Walters collection and generated diagrams directly from them. It was this prototype work that convinced me that generating data out of existing formulas was a terrible idea and would never work at scale. Nevertheless, I decided that the first step in my experiment would be to attempt to parse the collation formulas in Parker on the Web and convert them into XML files following the rules for our collation models. I wrote scripts to pull the formulas out of the Parker records and got to work figuring out rules that would describe the conversion from formula to XML. As I spent a few hours on this, I was reminded of why we decided to move from processing formulas to creating new models in the first place. 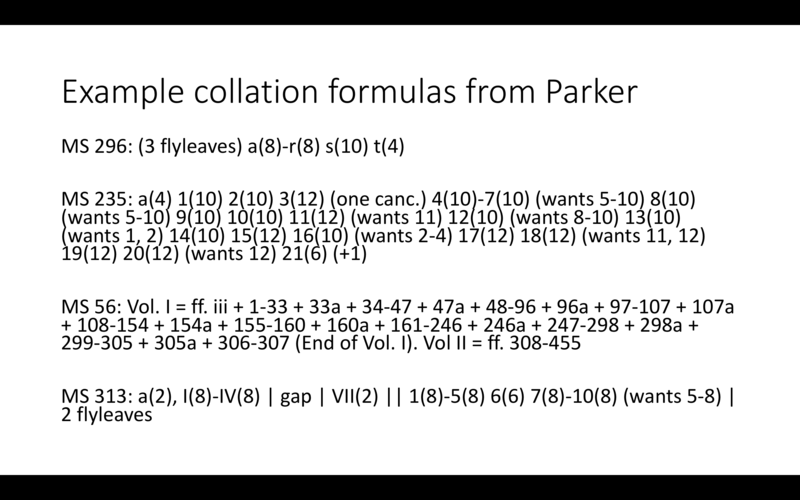 The collation formulas in Parker on the Web are inconsistent (this is not a criticism of Parker on the Web – the formulas come from different catalogues created over time by many different people, with no shared guidelines. The same thing would happen in any project that combines existing catalogs). Unlike with printed books, there is no standard for manuscript collation formulas, and the formulas in Parker on the Web have a lot of variance among them, notably that some use Arabic numerals, some Roman numerals, and some letters, while some describe flyleaves as quires and some do not. Because of the inconsistency, it was very difficult to get a handle on every single thing that would need to be caught by a process in order to convert every detail of a formula into an XML model. The use of letters, Arabic numerals, and Roman numerals is one example. 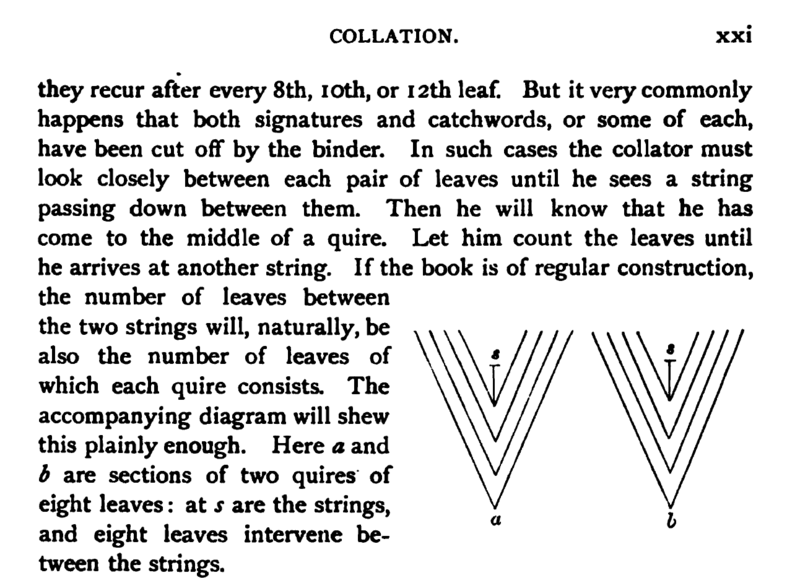 In order to identify quires I would need a script that would be able to interpret each of these, to recognize when a quire identified by a letter was a set of flyleaves and when not, and to be able to generate multiple quires when presented with a span of numbers or letters. If you have a collection formula to work from its actually pretty easy to build a model for it in the Collation modeler. 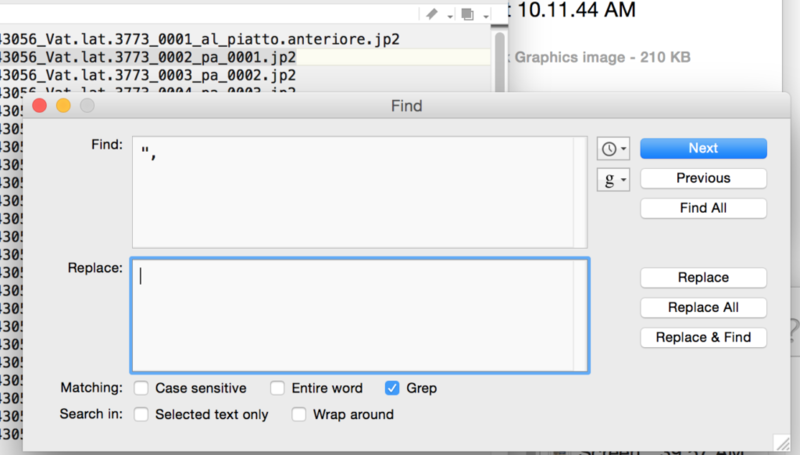 Here is MS 433 again, in the context of the collation modeler. Here in the main manuscript page, I’ve listed out all the quires in the manuscript and you can see the number of leaves in each. Using the collation modeler I can generate multiple regular quires all at once and then modify them, or create quires one-at-a-time. Folio numbers are generated automatically, but if the manuscript is paginated I need to change the folio numbers to page numbers (formatted as two numbers separated by a dash); to make this easier I wrote a script to fix the numbering in the finished collation model rather than doing it in the modeler (pagination will be built into the system for the new data model). 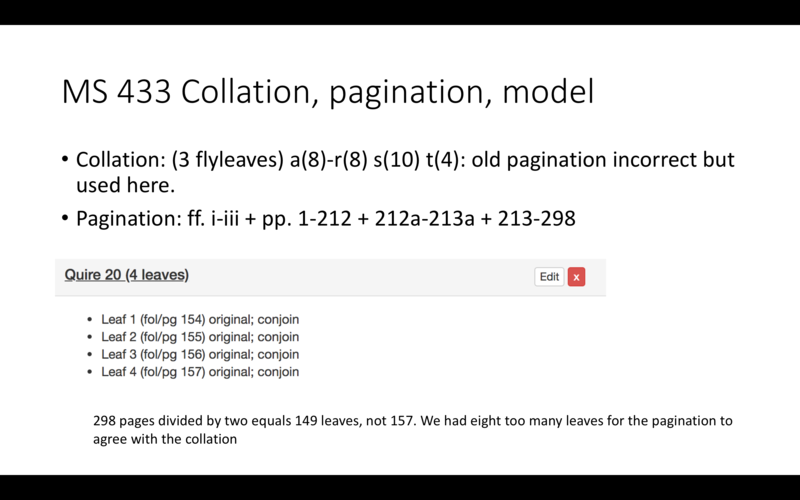 Taking a look at Quire 3, we can see the list of leaves, the folio numbering (which again I can change – we can also renumber completely from any point in the manuscript, if for example the numbering skips a leaf or numbers repeat). We can also note the “mode” of a leaf – is it original to the manuscript, added, a replacement, or missing? Once the model is built in the collation modeler, I output the collation model, which is an XML file. And then I processed this model using the existing scripts and got diagrams, bifolia view, and a collation formula (the script actually generates a set of formulas – we can generate as many different flavors of formula as we need). You will note that the formula isn’t exactly like the formula from the record. That’s because the first data model is very simple and doesn’t indicate advanced things like gaps or quire groupings (indicated by “gap” and || dividers in this formula). This is actually something that can be done in the second data model, so hopefully by the end of the summer we’ll be able to output something that looks more like the record formula, and also include that information with the diagrams and bifolia view. Once I decided to forego processing the formulas, work progressed more quickly. I was able to get 21 formulas into the collation modeler within a few hours spread out over two days. In addition to referencing the formula I would also reference the folio or page numbering in the manuscript description (which describes when page numbers are missing, repeated, or otherwise inconsistent), and at times I would reference the image files too (although I did that to double-check numbering, not to seek out physical clues to collation). Work slowed down again when I discovered while entering the data that in several cases the foliation or pagination given in the record didn’t agree with the numbering required by the given collation formula. 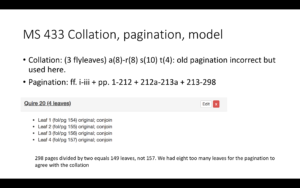 In the Collation Modeler you specify which folio or page aligns with which leaf in a quire – there should be a 1:1 correspondence between foliated leaves or pairs of paginated pages and leaves listed in the collation model. 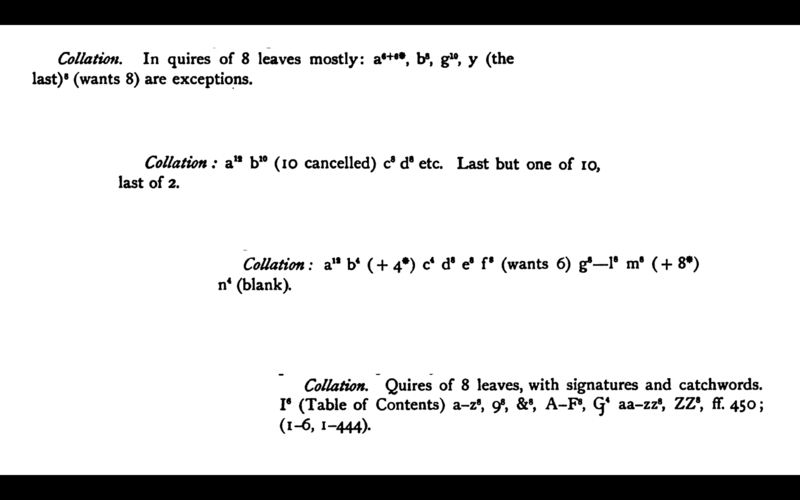 The first time I noticed this, a manuscript with several regular quires of 8 ended up with 8 more leaves required by the formula than were accounted for in the manuscript description. I figure that the person who made the formula got caught up in the regular quires and just added an extra one to the count, so I was comfortable removing one quire of 8 from the model. It’s not always this clear, however. I have a list of manuscripts that I was unable to make models for because of slight variations between numbers of leaves needed by the model and the number of pages or folios listed in the description. Somebody would need to sit down with the manuscripts to see if the problem is with the formula or the foliation or pagination. (This shows one of the positive side effects of the collation modeling approach that I didn’t consider when we started, it can be used as a tool in the catalogers toolkit to double-check both the collation and numbering to ensure they align). I’ve created a website that links brief records to the Parker on the Web and the diagram/bifolia collation views, just for fun (and I’m afraid it’s not very pretty). 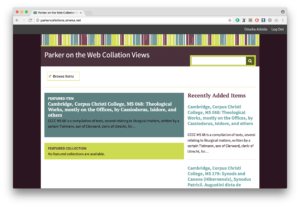 But if you’d like to see that you can visit parkercollations.omeka.net. 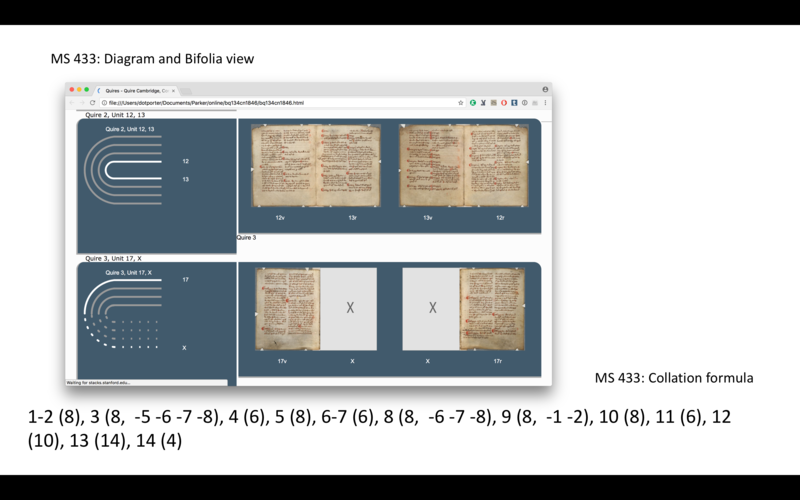 Although the combined diagram/bifolia view is interesting on its own, I’m most interested in how it might be combined with the more traditional facing-page view to provide an alternative access/navigation to digitized manuscripts. I’m currently co-PI on Bibliotheca Philadelphiensis (BiblioPhilly), a collaboration between the University of Pennsylvania, the Free Library of Philadelphia, Lehigh University, and the Philadelphia Area Consortium of Special Collections Libraries (PACSCL) and funded by the Council on Library and Information Resources. 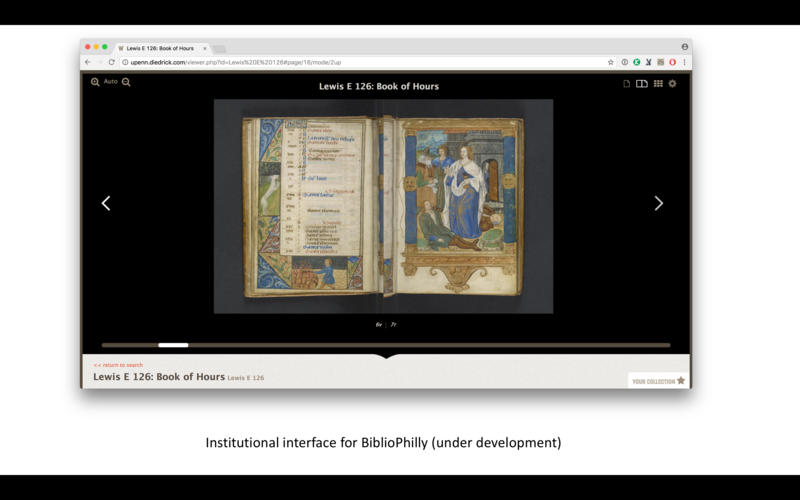 BiblioPhilly serves to digitize all the medieval manuscripts in Philadelphia written in Europe before 1600 (476 of them, not including several hundred already digitized at Penn). We have incorporated collation modeling into our cataloging workflow, and we are working with a software developer to build an interface that will make the collation information an integral part of the experience. Here are some mock-ups that I made to pass along to the software developers so they can see what I’m thinking about, but there will be a certain amount of back and forth with them, and others in the project are involved in this, so I’m not really sure what we’ll come up with but I’m excited to see it. And the reason we can do this is because we have the data. Now we can build the processes. 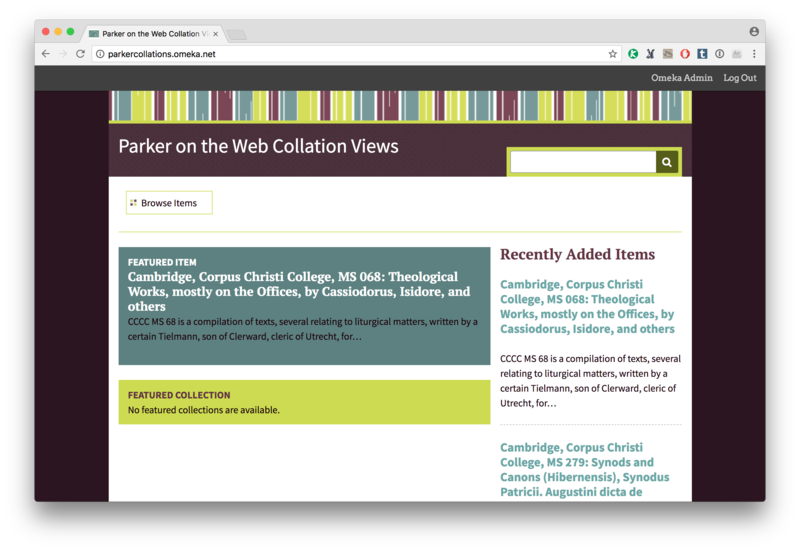 There’s no reason not to incorporate collation views of some kind into the navigation options of the Parker on the Web and other IIIF collections. There would need to be a standard way to model the collation within IIIF manifests, and then add a plug-in to the IIIF image viewers that takes advantage of that new data in new and interesting ways. 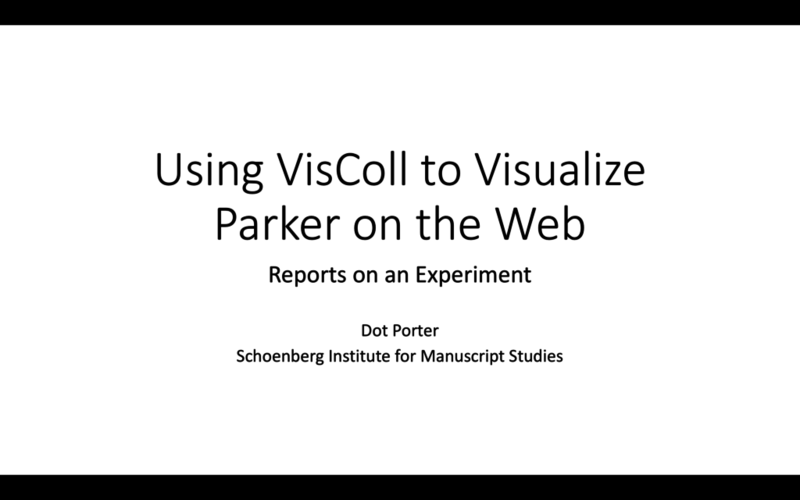 I hope that our experience with integrating VisColl into BiblioPhilly from the beginning, and my experiments building models from the Parker formulas for this talk, will encourage Parker on the Web and other libraries to develop more experimental interfaces for their digitized manuscripts. This works on one level: if you paged through this in an interface using a Book View, you would be presented with the conjoin leaves as sheets. But it’s really just another flat list of images, presented one after the other, just in a different order than they are in the book (Edit on 3/20/2018: It’s come to my attention that this is the general approach used by the Electronic Beowulf 4.0, in that edition’s collation navigation, so if you want to try paging through manuscript images organized by bifolia you can do it there. Instructions are here; be sure to select manuscript for both sides or else it’s not possible to click the collation option). 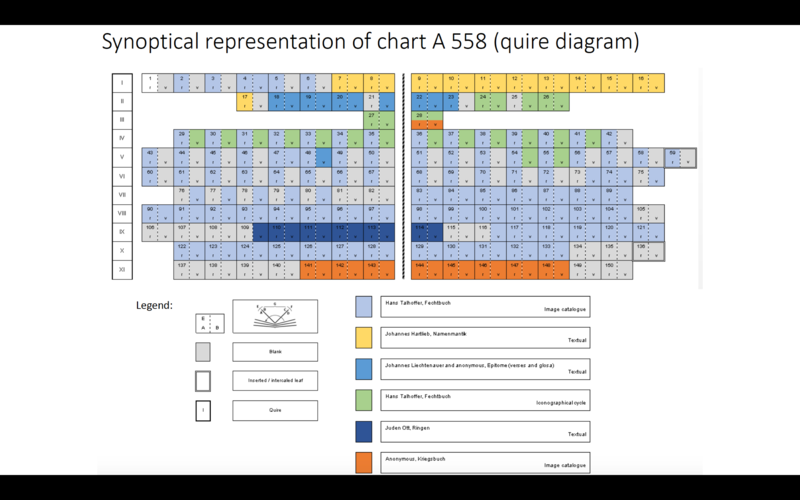 This approach doesn’t really express the structural, three-dimensional aspect of the manuscript’s collation, so it can’t be used to generate alternative views (like diagrams or formulas). I think that a manifest like this could, however, be another kind of output from a collation model, but I think for IIIF it would make more sense to make the model part of the manifest, or something standard that IIIF APIs combine with manifests, to create any number of collation-aware views. 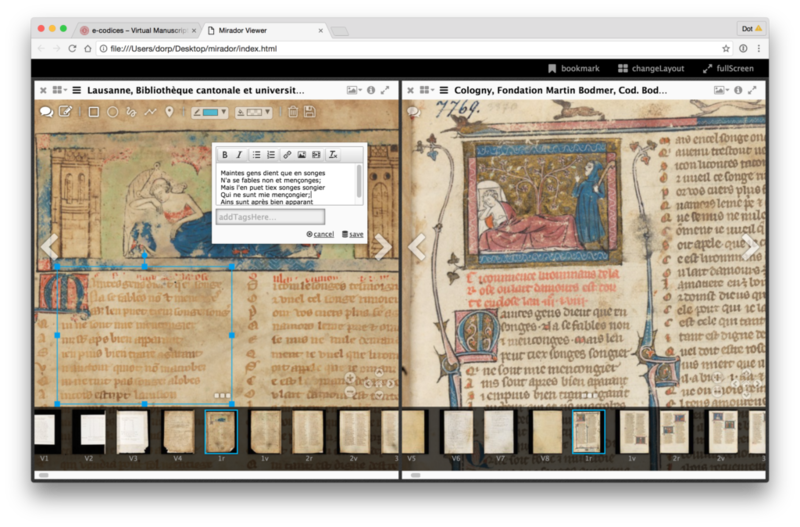 So you’ve just digitized medieval manuscripts from your collection and you’re putting them online. Congratulations! That’s great. Online access to manuscripts is so important, for scholars and students and lots of other people, too (I know a tattoo artist who depends on digital images for design ideas). 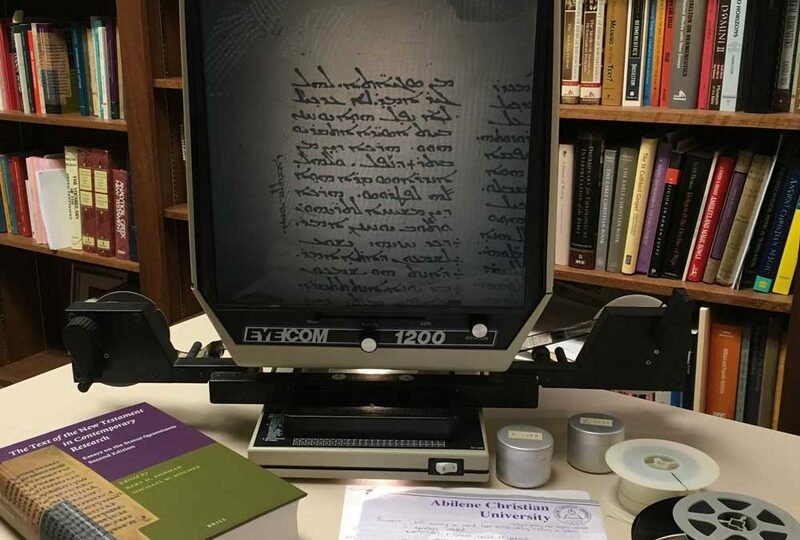 As the number of collections available online has grown in recent years (DMMAP lists 545 institutions offering at least one digitized manuscript), the use of digital manuscripts by medievalists has grown right along with supply. 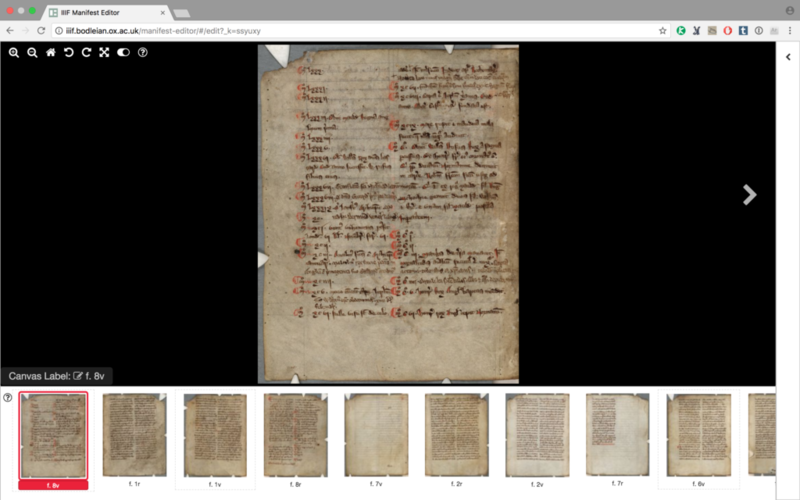 If you’re a medievalist and you study manuscripts, I’m confident that you regularly use digital images of manuscripts. So every new manuscript online is a celebration. But now, you who are making digitized medieval manuscripts available online, tell us more. How, exactly, are you making your manuscripts available? And please don’t say you’re making them freely available online. I hate this phrase. It makes my teeth clench and my heart beat faster. It makes me feel this way because it doesn’t actually tell me anything at all. I know you are publishing your images online, because where else would you publish them (the age of CDRom for these things is long gone) and I know they are going to be free, because otherwise you’d be making a very different kind of announcement and I would be making a very different kind of complaint (I’m looking at you, Codices Vossiani Latini Online). What else can you tell me? Here are the questions I want answered when I read about an online manuscript collection. How are your images licensed? This is going to be my first question, and for me it’s the most important because it defines what I can do with your images. Are you placing them in the public domain, licensing them CC0? 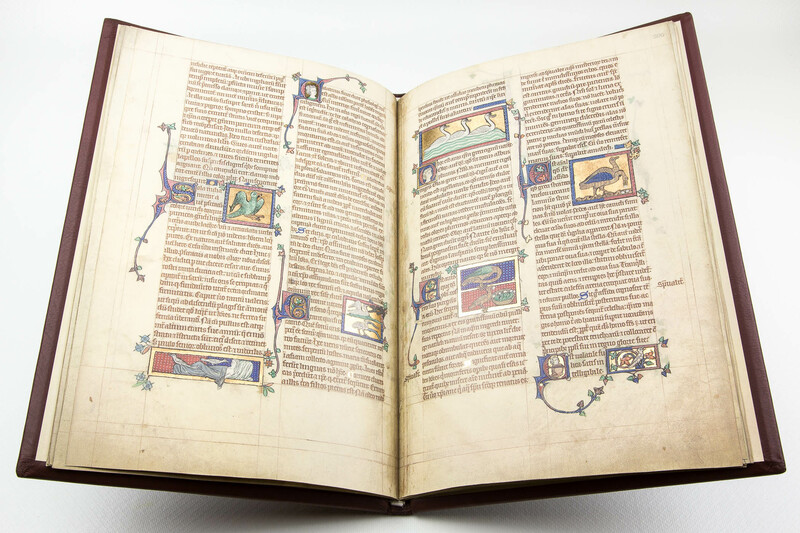 This is what we do at my institution, and it’s what I like to see, since, you know, medieval manuscripts are not in copyright, at least not in the USA (I understand things are more complicated in Europe). If not CC0, then what restrictions are you placing on them? Creative Commons has a tool where you can select the restrictions you want and then gives you license options. Consider using it as part of your decision-making process. A clear license is a good license. How can I find your manuscripts? Is there a search and browse function on your site, or do I have to know what I’m looking for when I come in? What kind of interface will you have? 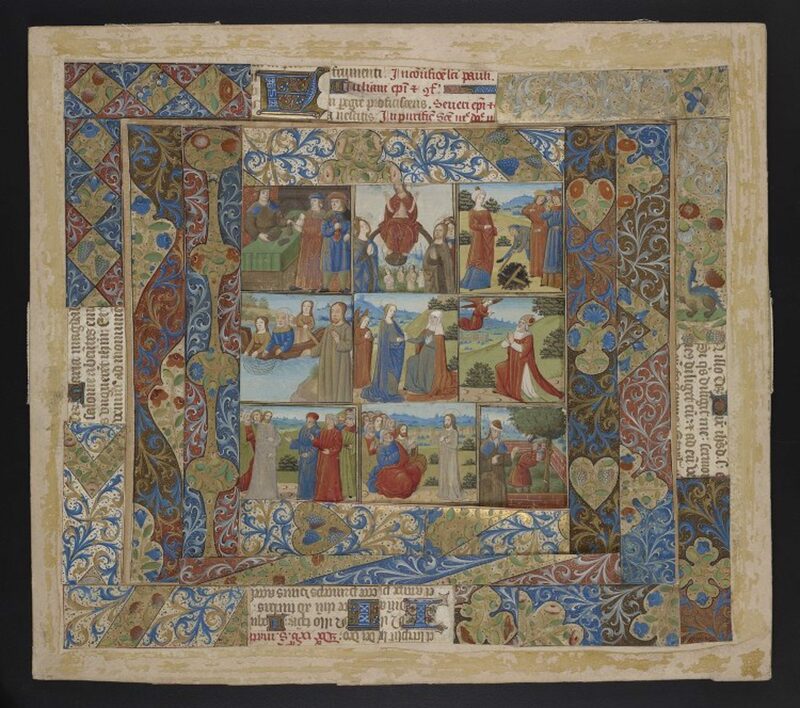 I usually assume that a page-turning interface will be provided, but if there is some other interface (like, for example, Yale University, which links individual images from a thumbnail strip on the manuscript record) I’d like to know that. 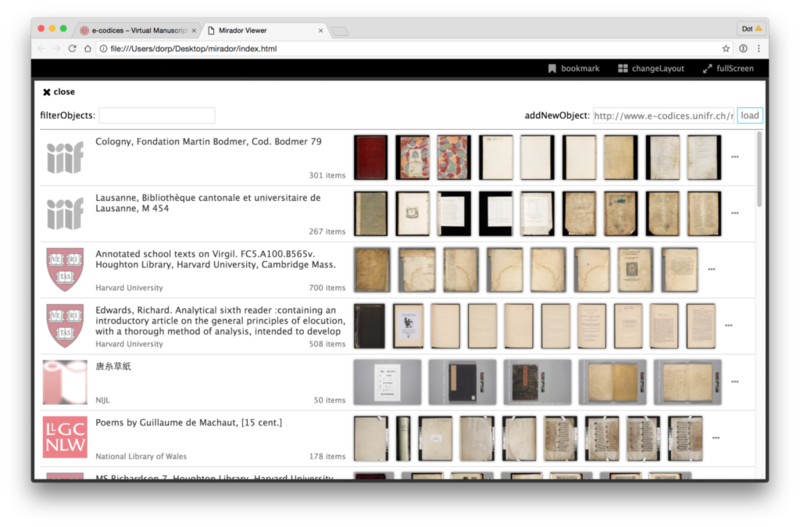 Will users be able to build collections or make annotations on page images, or contribute transcriptions? I’d like to know that, too. How can I get your images? I know you’re proud of your interface, but I might want to do something else with your images, either download them to my own machine or point to them from an interface I’ve built myself or borrowed from someone else (maybe using IIIF, but maybe not). 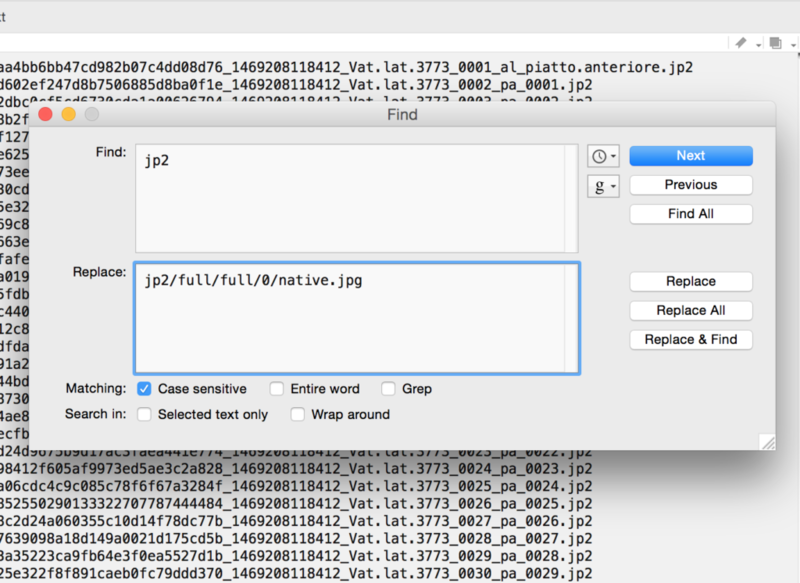 If you provide IIIF manifests I have a list of URLs I can use to point to or download your image files (more or less, depending on how your server works), but if you’re not using IIIF, is there some other way I can easily get a list of image URLs for a manuscript? 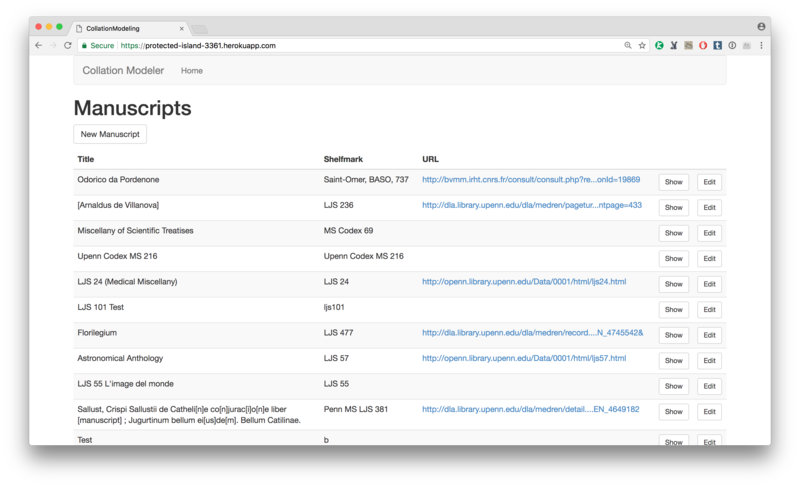 For example, OPenn and The Digital Walters publish TEI documents with facsimile lists. 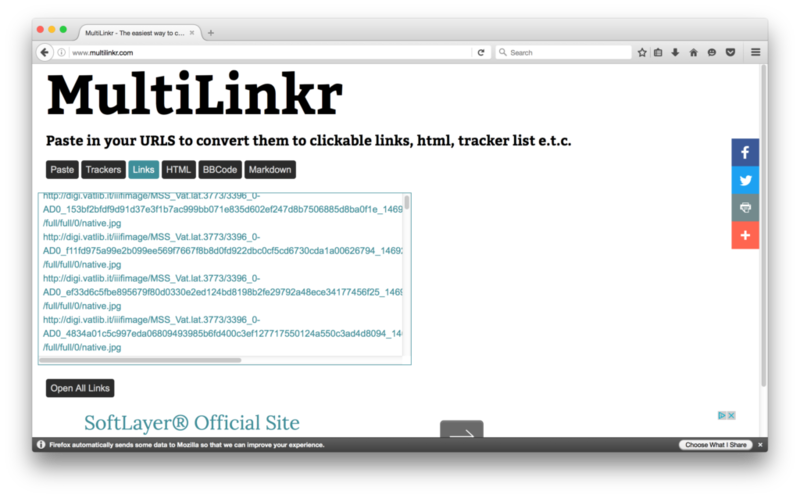 If you can’t provide a list, can you at least share how your urls are constructed? If I know how they’re made I can probably figure out how to build them myself. Those are the big five questions I like to have answered when I read about a new digital manuscript collection, and they very rarely are. Please, please, please, next time you announce a new collection, try to go beyond freely available online and tell us all more about how your collection will be made available, and what users will be able and allowed to do with it. This week I presented this talk as the opening keynote for the Digital Scholarly Editions as Interfaces conference at the University of Graz. The conference is hosted by the Centre for Information Modelling, Graz University, the programme chair is Georg Vogeler, Professor of Digital Humanities and the program is endorsed by Dixit – Scholarly Editions Initial Training Network. Thanks so much to Georg for inviting me! And thanks to the audience for the discussion after. I can’t wait for the rest of the conference. What is an edition anyway? Thank you to Georg Voegler for inviting me to present the keynote at the symposium, thank you Dixit for making this conference possible, and danke to welcoming speakers for welcoming us so warmly. I’m excited to be here and looking forward to hear what the speakers have to say about digital scholarly editions as interfaces. Georg invited me here to talk about my work on medievalists use of digital editions. But first, I have a question. What is an edition? I think we all know what an edition is, but it’s still fun, I find, to investigate the different ways that people define edition, or think about editions, so despite the title of this talk, most of what I’m going to be talking about is various ways that people think about editions and why that matters to those of us in the room who spend our time building editions, and at the end I’m going to share my thoughts on directions I’d like to see medieval editions in particular take in the future. I’ll admit that when I need a quick answer to a question, often the first place I turn to is Google. Preparing for this talk was no different. 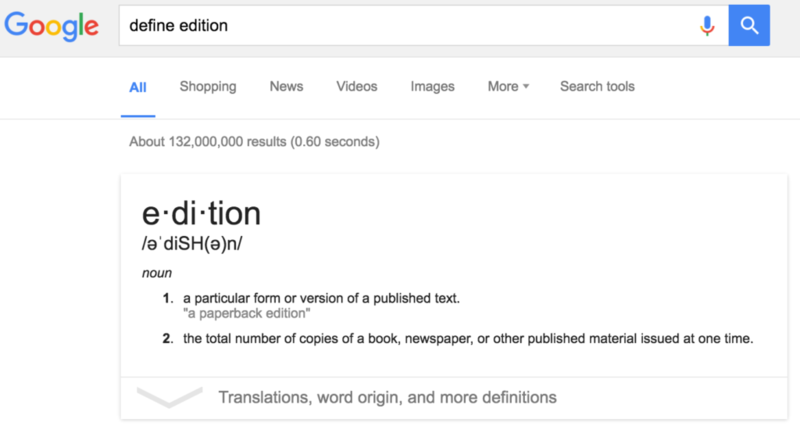 So, I asked Google to define edition for me, and this is what I got. No big surprise. Two definitions, the first “a particular form or version of a published text,” and the second “the total number of copies of a book, newspaper, or other published material issued at one time.” The first definition here is one that’s close to the way I would answer this question myself. I think I’d generally say that an edition is a particular version of a text. It might be a version compiled together from other versions, like in a scholarly critical edition, but need not be. I’m a medievalist, so this got me thinking about texts written over time, and what might make a text rise to the level of being an “edition”, or not. Bankes Papyrus, British Museum Papyrus 114. So here is some text from the Illiad, written on a papyrus scroll I the 2nd century BC. The scroll is owned by the British Museum, Papyrus 114 also known as the Bankes Papyrus. The Illiad, you probably know, is an ancient Greek epic poem set during the Trojan war, which focuses on a series of battles between King Agamemnon and the warrior Achilles. If you are a Classicist, I apologize in advance for simplifying a complex textual situation. If you aren’t a Classicist, if you’ve read the Illiad you probably read it in a translation from Greek into your native language, and this text most likely would have been presented to you as “The Text of The Illiad” – that is, a single text. That text, however, is built from many small material fragments that were written over a thousand years, and which represent written form of text that was composed through oral performance. 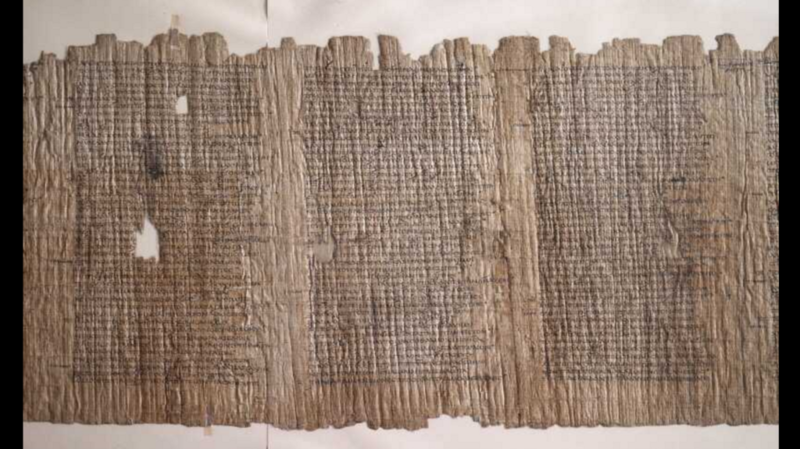 The Bankes Papyrus is actually one of the most complete examples of the Illiad in papyrus form – most surviving examples are much more fragmentary than this. 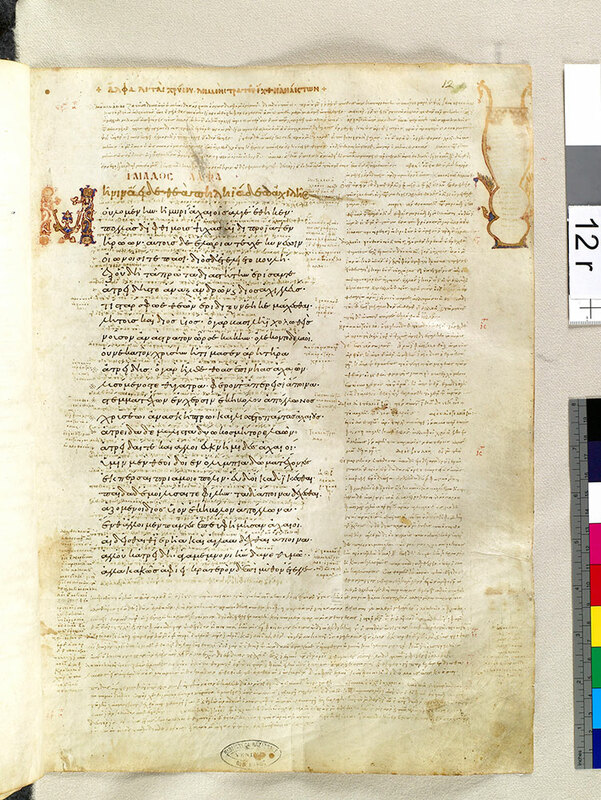 As far as we know the text of the Illiad was only compiled into a single version in the 10th century, in what is known as the Venetus A manuscript, now at the Marciana Library in Venice. I have an image of the first page of the first book of the Illiad here. You can see that this presents much more than the text, which is the largest writing in the center-left of the page. This compiled text is surrounded by layers of glossing, which includes commentary as well as textual variants. UPenn Ms Codex 1058, fol. 12r. The Venetus A is just one example of a medieval glossed manuscript. Another more common genre of glossed manuscripts are Glossed Psalters, that is, texts of the Psalter written with glosses, quotes from the Church Fathers, included to comment on specific lines. Here is an example of a Glossed Psalter from the University of Pennsylvania’s collection. This is a somewhat early example, dated to around 1100, which is before the Glossa Ordinara was compiled (the Glossa Ordinaria was the standard commentary on the scriptures into the 14th century). Although this isn’t as complex as the Venetus A, you can still see at least two levels of glossing, both in the text and around the margins. UPenn Ms. Codex 1640, fol. 114r. One more example, a manipulus florum text from another University of Pennsylvania manuscript. Thomas of Ireland’s Manipulus florum (“Handful of flowers”), compiled in the early 14th century, belongs to the genre of medieval texts known as florilegia, collections of authoritative quotations that are the forerunners of modern reference works such as Bartlett’s Familiar Quotations and The Oxford Dictionary of Quotations. This particular florilegium contains approximately 6000 Latin proverbs and textual excerpts attributed to a variety of classical, patristic and medieval authors. The flora are organized under alphabetically-ordered topics; here we see magister, or teacher. The red text is citation information, and the brown text is the quotes. 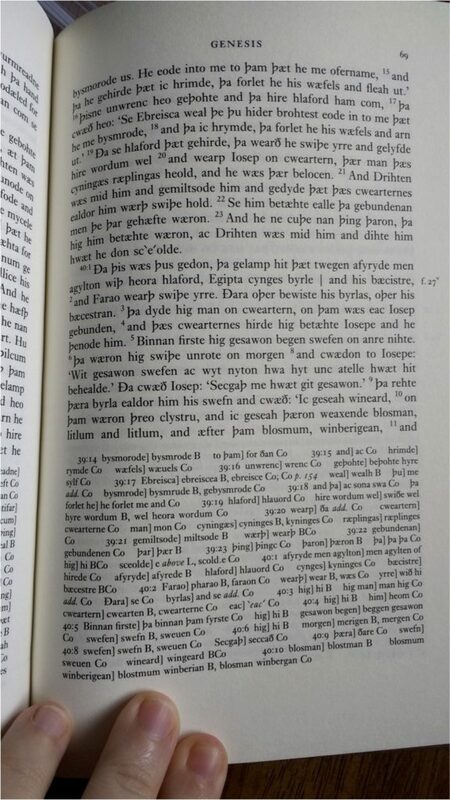 Now let’s take a look at a modern edition, Richard Marsden’s 2008 edition of The Old English Heptateuch published with the Early English Text Society. A glance at the table of contents reveals an introduction with various sections describing the history of editions of the text, the methodology behind this edition, and a description of the manuscripts and the relationships among them. This is followed by the edited texts themselves, which are presented in the traditional manner: with “the text” at the top of the page, and variant readings and other notes – the apparatus – at the bottom. In this way you can both read the text the editor has decided is “the text”, but also check to see how individual manuscripts differ in their readings. It is, I’ll point out, very similar to the presentation of the Illiad text in the Venetus A. Electronic and digital editions have traditionally (as far as we can talk about there being a tradition of these types of editions) presented the same type of information as print editions, although the expansiveness of hypertext has allowed us to present this information interactively, selecting only what we want to see at any given moment and enabling us to follow trails of information via links and pop-ups. 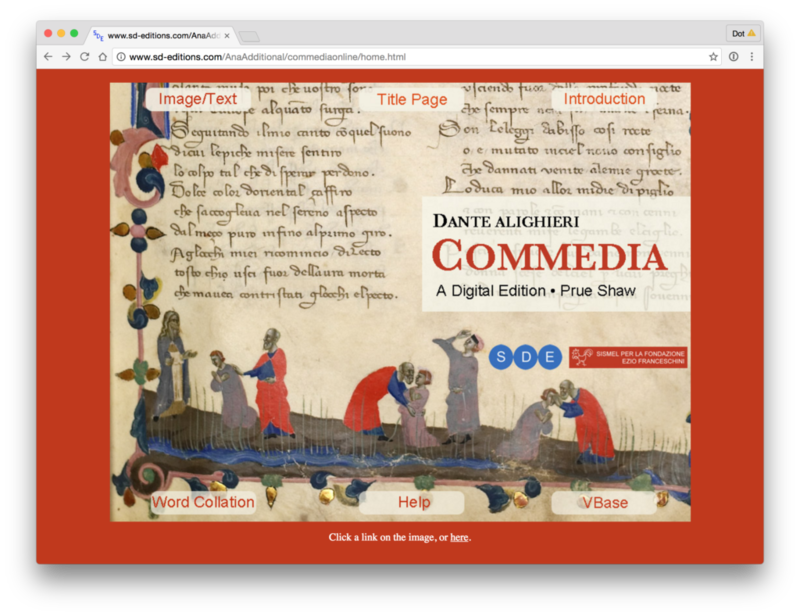 For example I have here Prue Shaw’s edition of Dante’s Commedia, published by the Scholarly Digital Editions. Here we have a basic table of contents, which informs us of the sections included in the edition. Here we have the edited text from one manuscript, with the page image displayed alongside (this of course being one of the main differences between digital and print editions), with variant readings and other notes available at the click of the mouse. A more extensive content list is also available via dropdown, and with another click I can be anywhere in the edition I wish to be. Here I am at the same point in the text, except the base text is now this early printed edition, and again the page image is here displayed so I can double-check the editor’s choices should I wish to. With the possible exception of the Bankes Papyrus, all of these examples are editions. They reflect the purpose of the editor, someone who is not writing original text but is compiling existing text to suit some present desire or need. 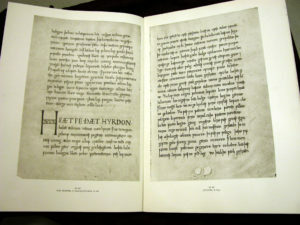 The only difference being the material through which the edition is presented – handwritten parchment or papyrus, usually considered “primary material”, vs. a printed book or digital media, or “secondary material”. And I could even make an argument that the papyrus is an edition as well, if I posit that the individual who wrote the text on the papyrus was compiling it from some other written source or even from the oral tradition. 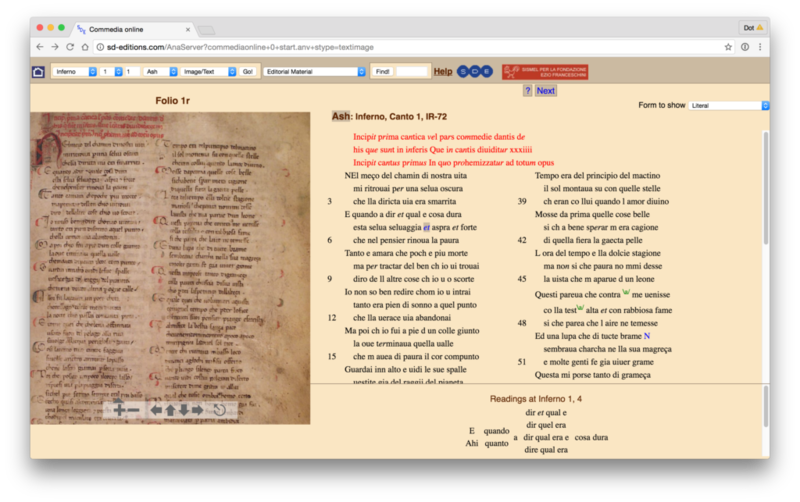 I’ve been studying the attitudes of medievalists towards digital resources, including editions, since I was a library science graduate student back in 2002. 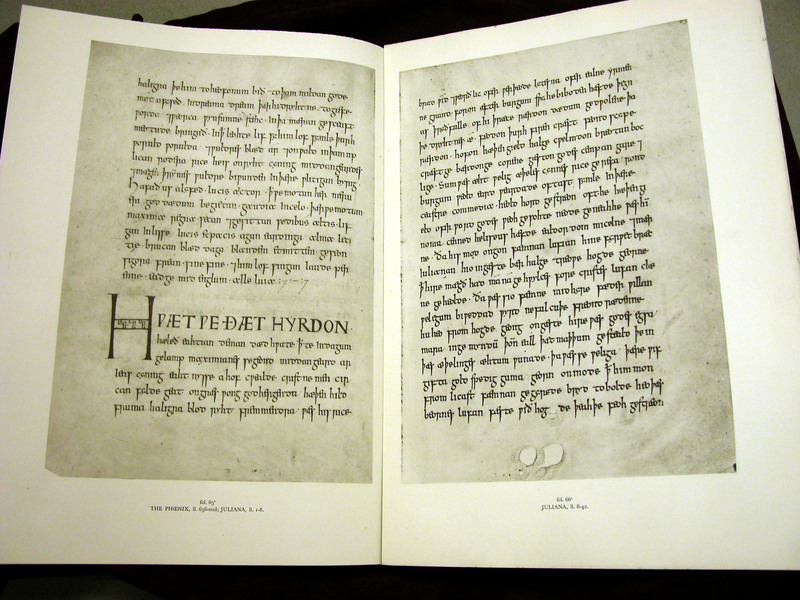 In May 2001 I graduated with an MA from the Medieval Institute at Western Michigan University, with a focus on Anglo-Saxon language, literature, and religious culture. I had taken a traditional course of work, including courses in paleography and codicology, Old English, Middle English, and Latin language and literature, and several courses on the reading of religious texts, primarily hagiographical texts. I was keenly aware of the importance of primary source materials to the study of the middle ages, and I was also aware that there were CD-ROMs available that made primary materials, and scholarly editions of them, available at the fingertips. 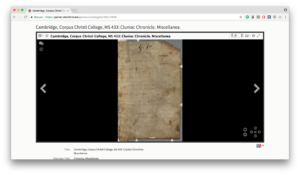 There were even at this time the first online collections of medieval manuscripts (notably the Early Medieval Manuscript Collection at the Bodleian Library at Oxford). But I was curious about how much these new electronic editions (and electronic journals and databases, too) were actually being used by scholars. 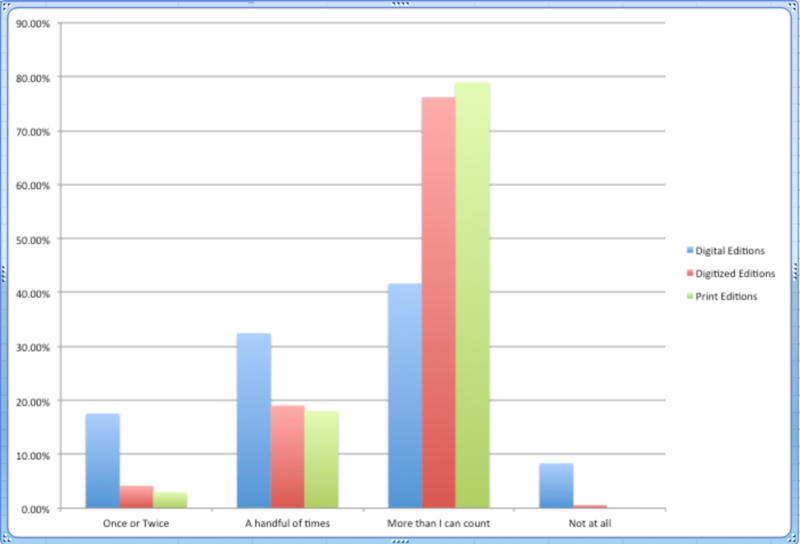 I conducted a survey of medievalists, asking them about their attitudes toward, and use of, electronic resources. I wrote my findings in a research paper, “Medievalists’ Use of Electronic Resources: The Results of a National Survey of Faculty Members in Medieval Studies,” which is still available if you want to read it, in the IU Bloomington institutional repository. I conducted a second survey in 2011, and compared findings from the two surveys in an article published in 2013 in Scholarly Editing, “Medievalists and the Scholarly Digital Edition.” The methodologies for these surveys were quite different (the first was mailed to a preselected group of respondents, while the second was sent to a group but also advertised on listservs and social media), and I’m hesitant to call either of them scientific, but with these caveats they do show a general trend of usage in the 9 years between, and this trend reflects what I have seen anecdotally. In this chart from 2002, we see that 7% of respondents reported using electronic and print editions the same, 44% print mostly, and 48% print only. Nine years later, while still no-one reports using only electronic editions, 7% report using electronic mostly, 12% electronic and print the same, 58% print mostly, and 22% print only. The largest shift is from “print only” to “print mostly”, and it’s most clearly seen on this chart. Now this is all well and good, and you’d be forgiven for looking at this chart and coming to the conclusion that all these folks had finally “seen the light” and were hopping online and on CD Rom to check out the latest high-tech digital editions in their field. 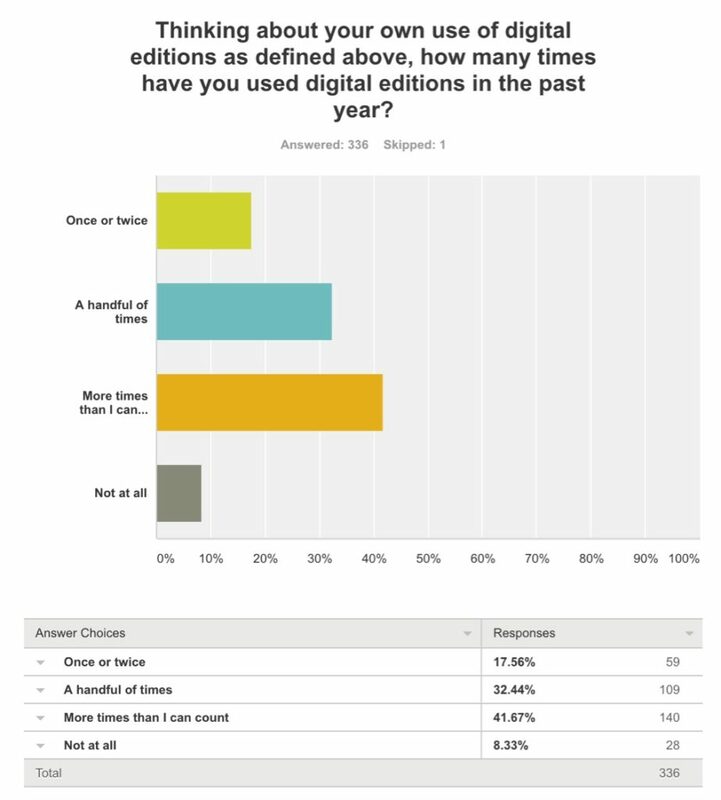 But the written comments show that this is clearly not the case, at least not for all respondents, and that any issues with the survey data come from a disconnect between how I conceive of a “digital edition” and how the respondents conceive of the same. Exhibit A: Comments from four different respondents explaining when they use digital editions and how they find them useful. I won’t read these to you, but I will point out that the phrase Google Books has been bolded in three of them, and while the other one doesn’t mention Google Books by name, the description strongly implies it. I have thought about this specific disconnect a lot in the past five years, because I think that it does reflect a general disconnect between how we who create digital editions think about editing and editions, and how more traditional scholars and those who consume editions think about them. Out of curiosity, as I was working on this lecture I asked on Facebook for my “friends” to give me their own favorite definition of edition (not digital edition, just edition), and here are two that reflected the general consensus. The first is very material, a bibliographic description that would be favored by early modernists (as a medievalist I was actually a bit shocked by this definition, although I know what an edition is, bibliographically speaking, I wasn’t thinking in that direction at that point, I was really thinking of a “textual edition”), while the second focuses not so much on how the text was edited but on the apparatus that comes along with it. Thus, an edited text by itself isn’t properly an edition, it requires material explaining the text to be a “real” edition. Interestingly, this second definition arguably includes the Venetus A manuscript we looked at earlier. Digital scholarly editions are not just scholarly editions in digital media. I distinguish between digital and digitized. A digitized print edition is not a “digital edition” in the strict sense used here. A digital edition can not be printed without a loss of information and/or functionality. The digital edition is guided by a different paradigm. If the paradigm of an edition is limited to the two-dimensional space of the “page” and to typographic means of information representation, than it’s not a digital edition. 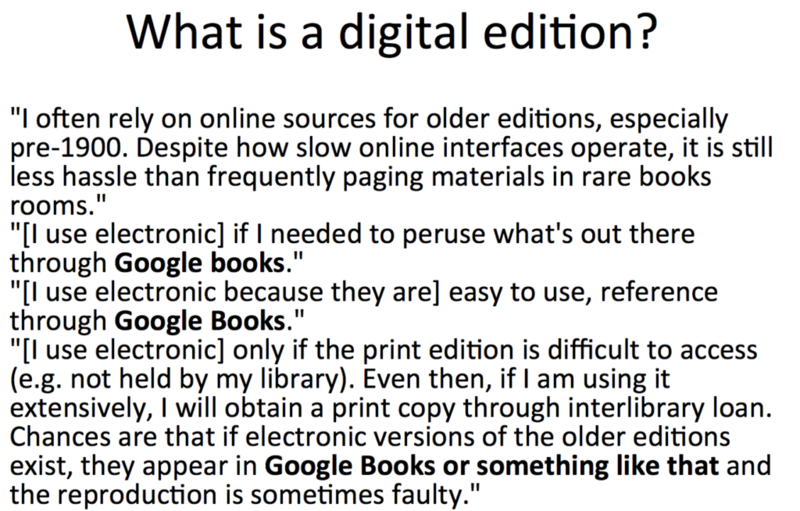 In this definition Sahle differentiates between a digital edition, which essentially isn’t limited by typography and thus can’t be printed, and a digitized edition, which is and which can. In practice most digitized editions will be photographic copies of print editions, although of course they could just be very simple text rendered fully in HTML pages with no links or pop-ups. 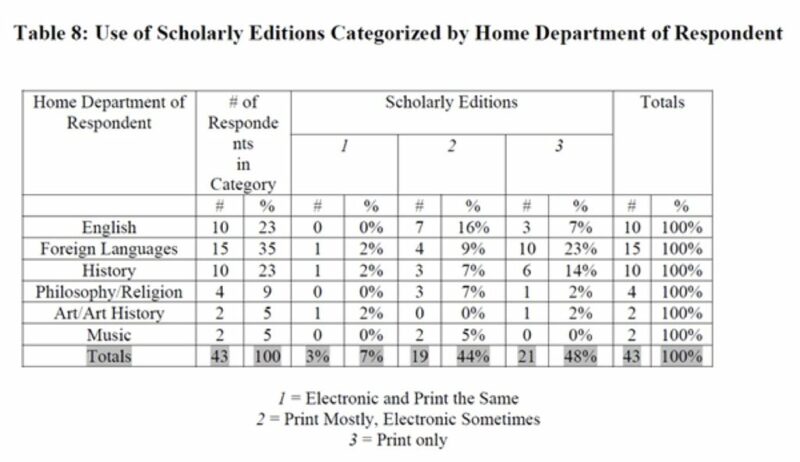 While the results of these lines of questioning aren’t directly comparable with the 2002 and 2011 results, I think it’s possible to see a general continuing trend towards a use of digitized editions, if not towards digital editions following Sahle’s definition. First, a word about methodology. This year’s respondents were entirely self-selecting, and the announcement of the survey, which was online, went out through social media and listservs. I didn’t have a separate selected group. There were 337 total respondents although not every respondent answered every question. 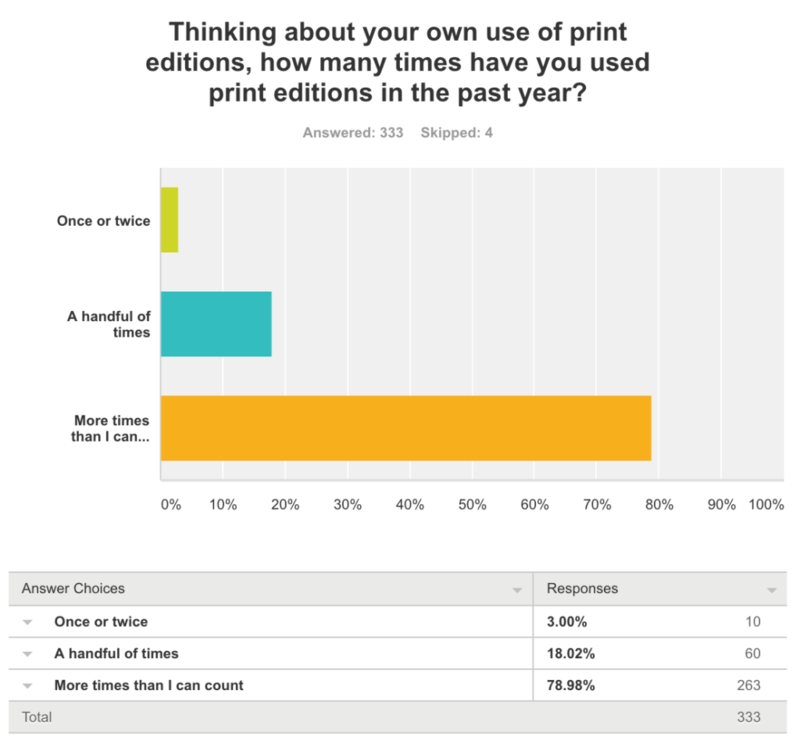 This year, I asked respondents about their use of editions – digital, digitized, and print – over the past year, focusing on the general number of times they had used the editions. Over 90% of respondents report using digital editions at all, although only just over 40% report using them “more times than I can count”. 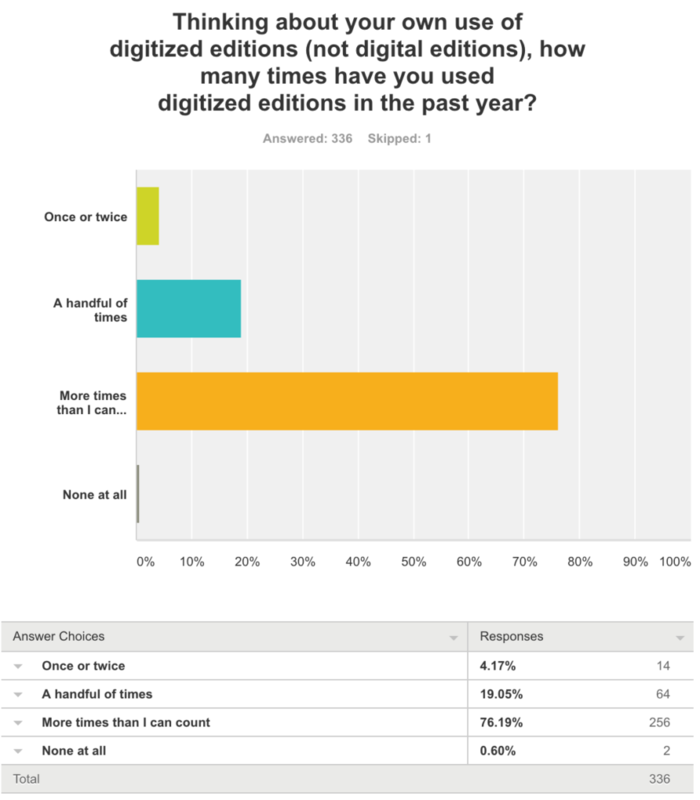 When asked about digitized editions, however, over 75% report using them “more times than I can count”, and only 2 respondents – .6% – report using them not at all. Print edition usage is similar to digitized edition usage, with about 78% reporting they use them “more times than I can count” and no respondents reporting they use them not at all. A chart comparing the three types of editions side-by-side shows clearly how similar numbers are for digitized and print editions vs. digital editions. 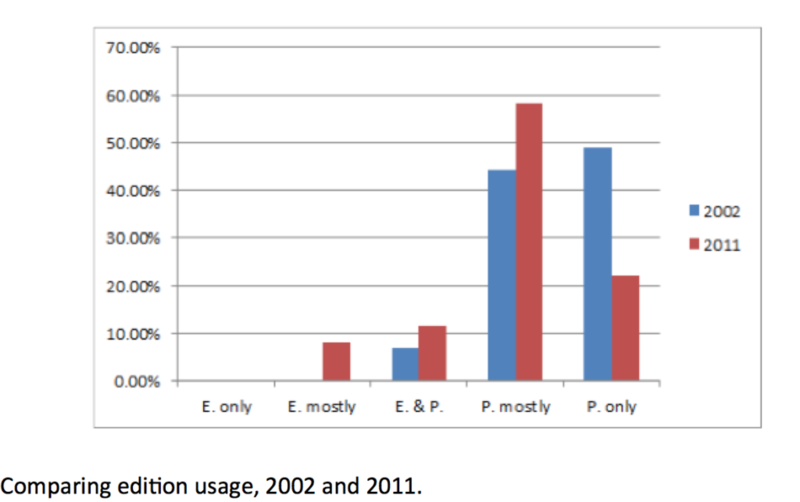 Comparing usage of Digital Editions, Digitized Editions, and Print Editions. I want to change gears and come back now to this question, what is an edition. I’ve talked a bit about how I conceive of editions, and how others do, and how if I’m going to have a productive conversation about editions with someone (or ask people questions on a survey) it’s important to make sure we’re on the same page – or at least in the same book – regarding what we mean when we say “edition”. But now I want to take a step back – way back – and think about what an edition is at the most basic level. On the Platonic level. If an edition is a shadow on the wall, what is casting that shadow? Some people will say “the urtext” which I think of (not unkindly, I assure you) as the floating text, the text in the sky. The text that never existed until some editor got her hands on it and brought it to life as Viktor Frankenstein brought to life that poor, wretched monster in the pages of Mary Shelley’s classic horror story. I say, we know texts because someone cared enough to write them down, and some of that survives, so what we have now is a written record that is intimately connected to material objects: text doesn’t float, text is ink on skin and ink on paper and notches in stone, paint on stone, and whatever else borne on whatever material was handy. So perhaps we can posit editions that are cast from manuscripts and the other physical objects on which text is borne, not simply being displayed alongside text, or pointed to from text, or described in a section “about the manuscript”, but flipping the model and organizing the edition according to the physical object. I didn’t come up with this idea, I am sad to say. 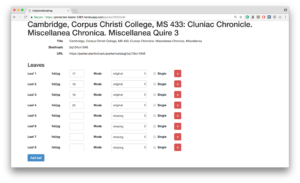 In 2015, Christoph Flüeler presented a talk at the International Congress on Medieval Studies titled “Digital Manuscripts as Critical Edition,” later posted to the Schoenberg Institute for Manuscript Studies blog. 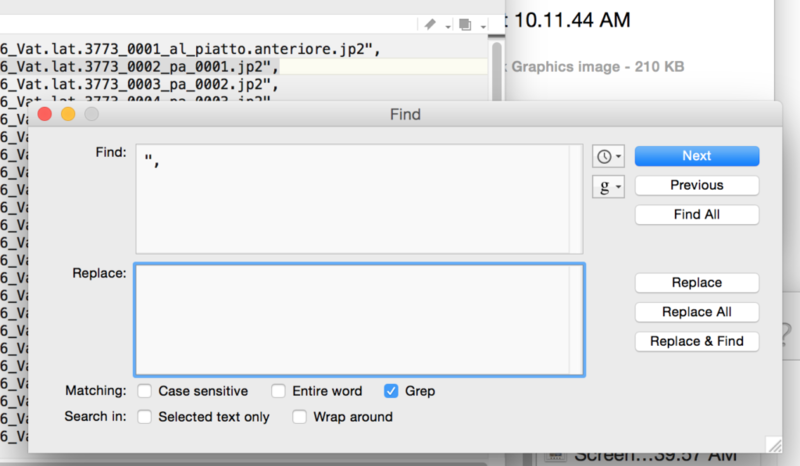 In this essay Flüeler asks: “… how [does] a digital manuscript [stand] in relation to a critical edition of a text. 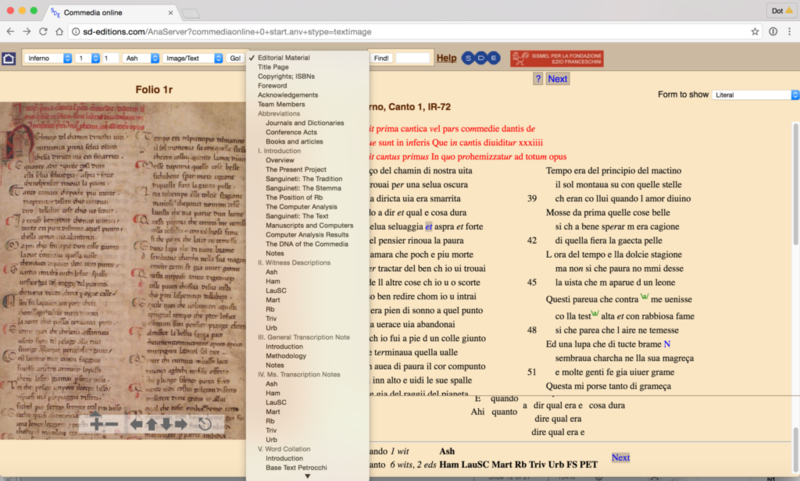 Can the publication of a digital manuscript on the internet be understood as an edition? Further: could such an edition even be regarded as a critical edition?” – His answer being, of course, yes. I won’t go into his arguments, instead I’m going to use them as a jumping-off point, but I encourage you to read his essay. This concept is very appealing to me. I suppose I should admit now, almost at the end of my keynote, that I am not presently doing any textual editing, and I haven’t in a few years. My current position is “Curator, Digital Research Services” in the Schoenberg Institute for Manuscript Studies at the University of Pennsylvania Libraries in Philadelphia. This position is a great deal of fun and encompasses many different responsibilities. 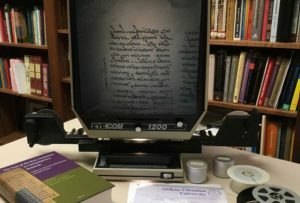 I am involved in the digitization efforts of the unit and I’m currently co-PI of Bibliotheca Philadelphiensis, a grant funded project that will digitize all the medieval manuscripts in Philadelphia, which I can only mention now but I’ll be glad to talk about more later to anyone interested in hearing about it. All our digital images are released in the public domain, and published openly on our website, OPenn, along with human readable HTML descriptions, links to download the images, and robust TEI manuscript descriptions available for download and reuse. I also do a fair amount of what I think of as experimental work, including new ways to make manuscripts available to scholars and the public. I’ve created electronic facsimiles in the epub format, a project currently being expanded by the Penn Libraries metadata group, which are published in our institutional repository, and I also make short video orientations to our manuscripts which are posted on YouTube and also made available through the repository. In the spring I presented on OPenn for a mixed group of librarians and faculty at Vanderbilt University in Tennessee, after which an art historian said to me, “this open data thing is great and all, but why can’t we just have the manuscripts as PDFs?” So I held my nose and generated PDF files for all our manuscripts, then I did it for the Walters Art Museum as well for good measure. I posted them all to Google Docs, along with spreadsheets as a very basic search facility. 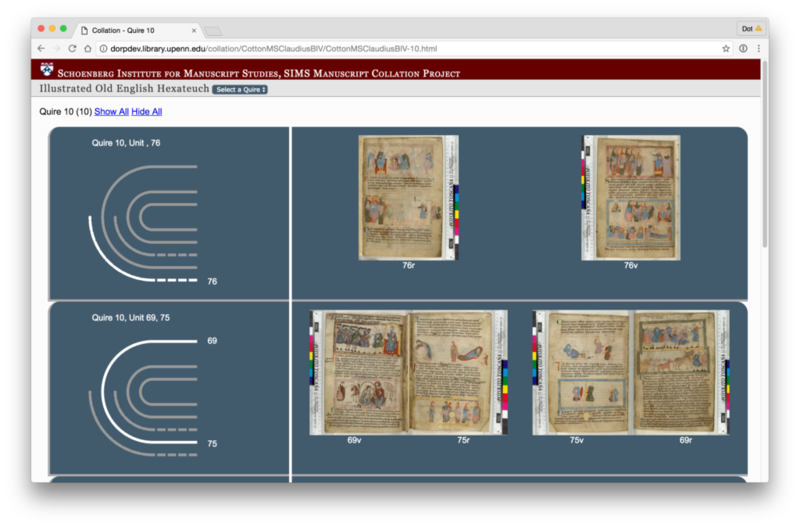 I’ve also been working for the past few years on developing a system for modeling and visualizing the physical collation of medieval manuscripts (this is distinct from textual collation which involves comparing versions of texts). With a bit of funding from the Mellon Foundation and the collaboration of Alexandra Gillespie and her team at the University of Toronto I am very excited for the next version of that system, which we call VisColl (it is on GitHub if like to check it out – you can see the code and there are instructions for creating your own models and visualizations). The next version will include facilities for connecting tags, and perhaps transcriptions, to the deconstructed manuscript. I hadn’t thought of the thing that this system generates as an edition, but perhaps it is. But instead of being an edition of a text, you might think of it as an edition of a manuscript that happens to have text on it (or sometimes, perhaps, won’t). 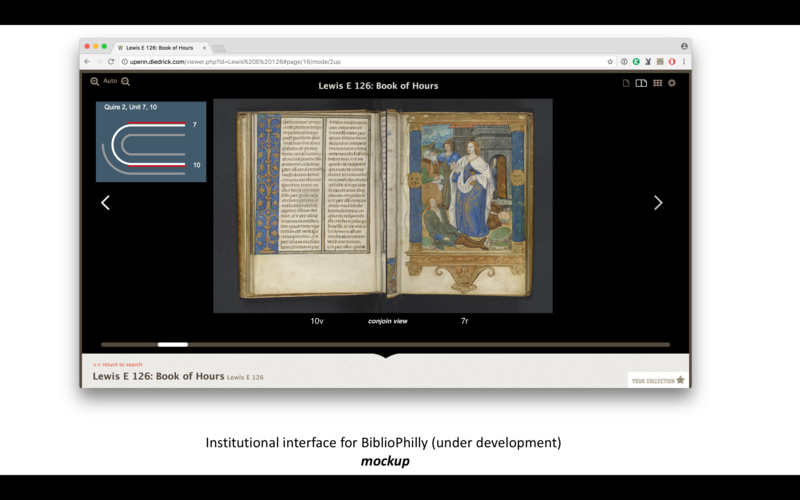 I am aware that I’m reaching the end of my time, so I just want to take a few minutes to mention something that I see playing an enormous role in the future of digital-manuscripts-as-editions, and that’s the International Image Interoperability Framework, or IIIF. I think Jeffrey Witt may mention IIIF in his presentation tomorrow, and perhaps others will as well although I don’t see any IIIF-specific papers in the schedule. 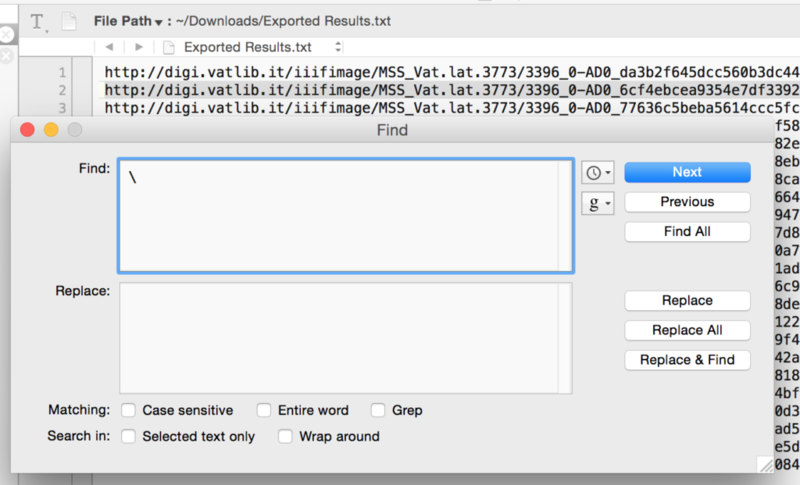 At the risk of simplifying it, IIIF is a set of Application Programming Interfaces (APIs) – sets of routines, protocols, and tools – to enable the interoperability of image repositories. 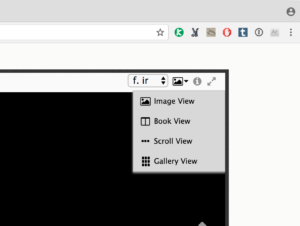 This means you can use images from different repositories in the same browser or other tool. Here, quickly, is an example of how that can work. e-codices publishes links to IIIF manifests for each of their manuscripts. A manifest is a json file that contains descriptive and structural metadata for a manuscript, including links to images that are served through a IIIF server. You can look at it. It is human readable, kind of, but it’s a mess. Two e-codices manuscripts (and others) in Mirador. However, if you copy that link and paste it into a IIIF-conformant tool such as Mirador (a simple IIIF browser which I have installed on my laptop) you can create your own collection and then view and manipulate the images side-by-side. Here I’ve pulled in two manuscripts from e-codices, both copies of the Roman de la Rose. And here I can view them side by side, I can compare the images, compare the text, and I can make annotations on them too. 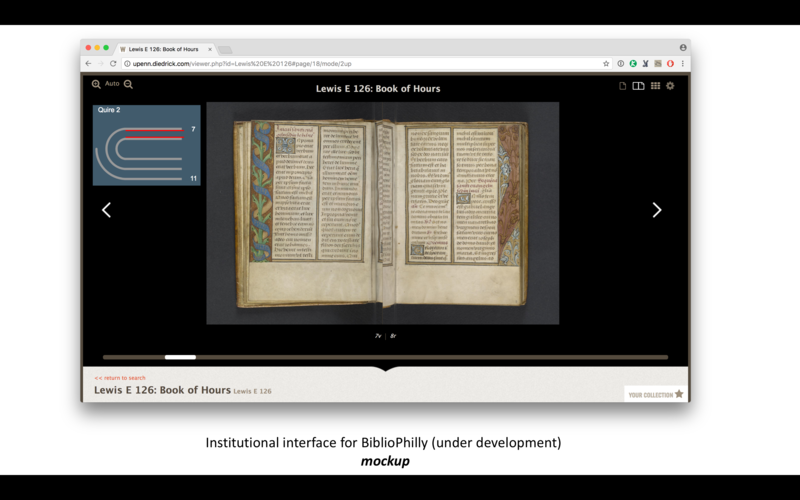 Here is tool for creating editions of manuscripts. However as fond as I am of IIIF, and as promising I think it is for my future vision, my support for it comes with some caveats. If you don’t know, I am a huge proponent of open data, particularly open manuscript data. The Director of the Schoenberg Institute is Will Noel, an open data pioneer in his own right who has been named a White House Champion of Change, and I take him as my example. I believe that in most cases, when institutions digitize their manuscript collections they are obligated to release those images into the public domain, or at the very least under a creative commons: by license (to be clear, a license that would allow commercial use) and that manuscript metadata should be licensed for reuse. My issue with IIIF is that is presents the illusion of openness without actual openness. That is, if images are published under a closed license, if you have the IIIF manifest you can use them to do whatever you want, as long as you’re doing it through IIIF-compliant software. You can’t download them and use them outside of the system (to, say, generate PDF or epub facsimiles, or collation visualizations). I love IIIF for what it makes possible but I also think it’s vital to keep data open so people can use it outside of any given system. 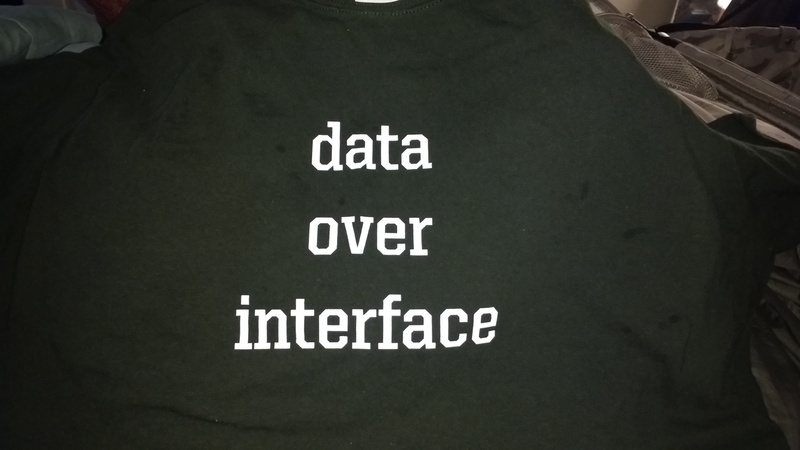 We have a saying around the Schoenberg Institute, Data Over Interface. 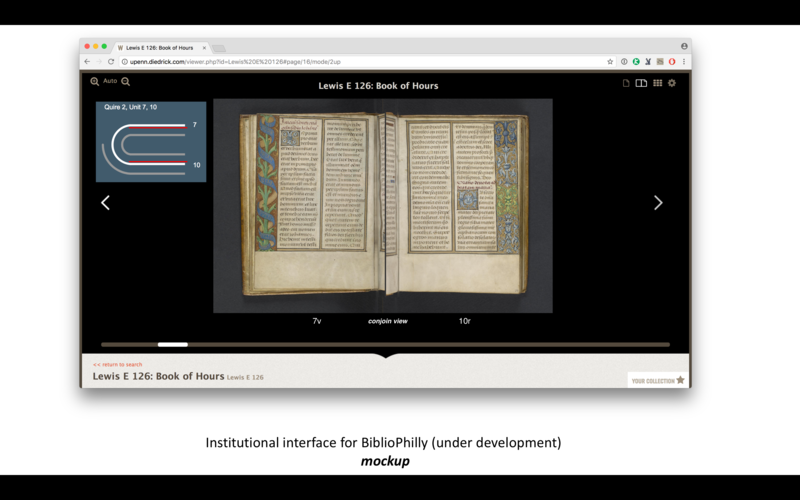 It was introduced to us by Doug Emery, our data programmer who was also responsible for the curation of the data of the Archimedes Palimpsest Project and the Walters Art Museum manuscripts. We like it so much we had it put on teeshirts (You can order your own here!). I like it, not because I necessarily agree that the data is always more important than the interface, but because it makes me think about whether or not the data is always more important than the interface. Excellent, robust data with no interface isn’t easily usable (although a creative person will always find a way), but an excellent interface with terrible data or no data at all is useless as anything other than a show piece. And then inevitably my mind turns to manuscripts, and I begin to wonder, in the case of a manuscript, what is the data and what is the interface? Is a manuscript simply an interface for the text and whatever else it bears, or is the physical object data of its own that begs for an interface to present it, to pull it apart and put it back together in some way to help us make sense of it or the time it was created? Is it both? Is it neither? I am so excited to be here and to hear about what everyone in this room is thinking about editions, and interfaces, and what editions are, and what interfaces are and are for. Thank you so much for your time, and enjoy the conference. Last week I posted on how to use a Firefox plugin called Down them All to download all the files from an e-codices IIIF manifest (there’s also a tutorial video on YouTube, one of a small but growing collection that will soon include a video outlining the process described here), but not all manifests include direct links to images. The manifests published by the Vatican Digital Library are a good example of this. The URLs in manifests don’t link directly to images; you need to add criteria at the end of the URLs to hit the images. What can you do in that case? 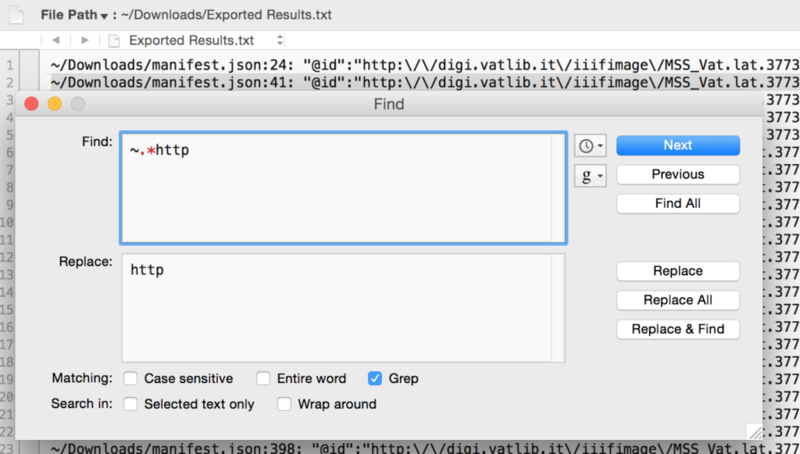 In that case, what you need to do it build a list of urls pointing to images, then you can use Down Them All (or other tools) to download them. In addition to Down Them All I like to use a combination of TextWrangler and a website called Multilinkr, which takes text URLs and turns them into hot links. Why this is important will become clear momentarily. 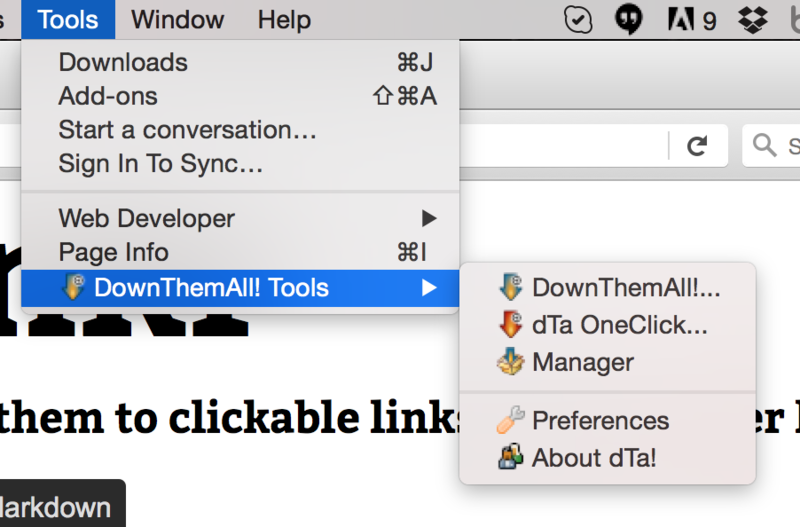 First, make sure you have all the software you’ll need: Firefox, Down Them All, and TextWrangler. Next, we need to pull all the base URLs out of the Vatican manifest. Find and replace. 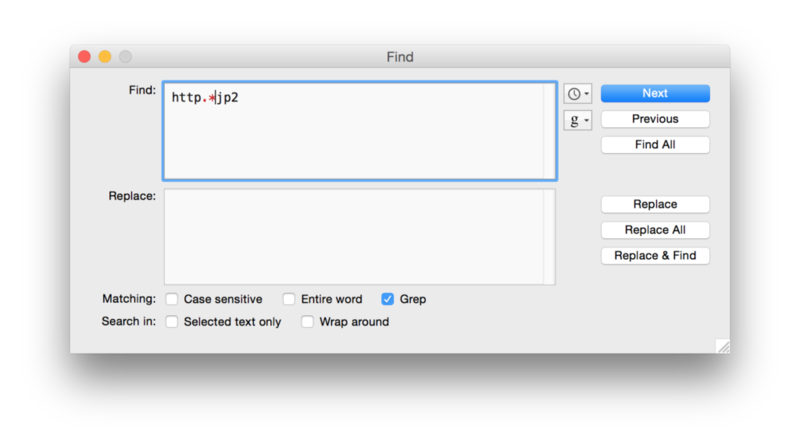 Don’t forget grep! Before first find and replace. After first find and replace. Before second find and replace. After second find and replace. Before the slash find and replace. After the slash find and replace. Hooray! We have our list of base URLs. Now we need to add the criteria necessary to turn these base URLs into direct links to images. Check out the bits after “jp2” in the URL. 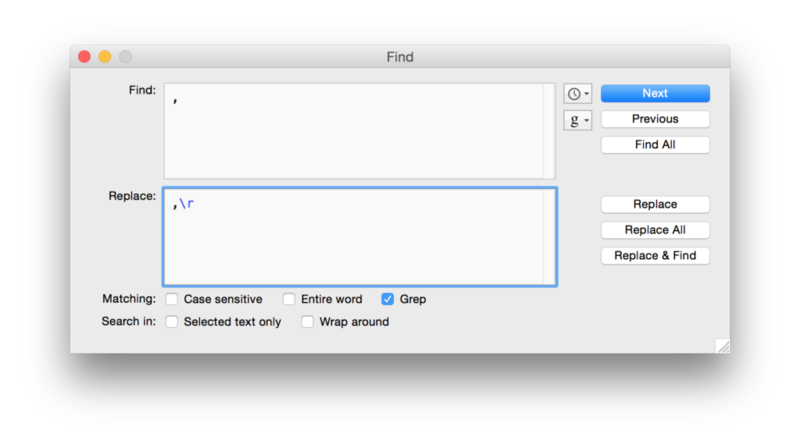 We’ll just do this using another find and replace in TextWrangler. 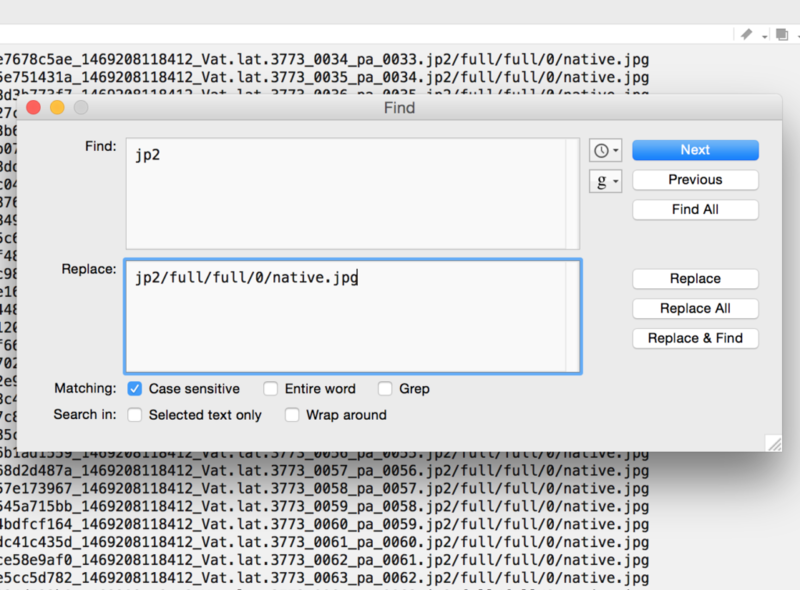 We’re just adding the additional criteria after the file extension, so all I do is find the file extension – jp2 – and replace all with “jp2/full/full/0/native.jpg”. Adding criteria: before find and replace. Adding criteria: After find and replace. Test one, just to make sure it works. Copy and paste the URL into a browser. 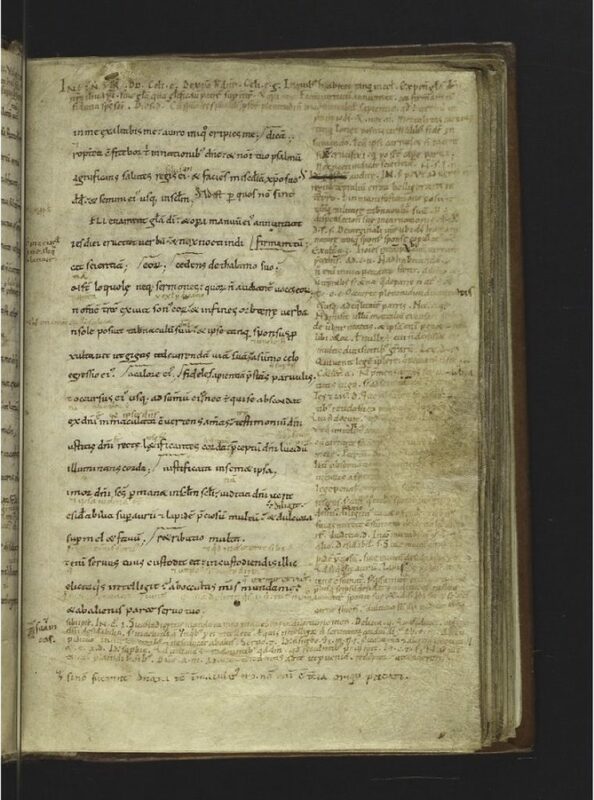 This is still a mouthful, but both the shelfmark (Vat.lat.3773) and the page number or folio number are there (here it’s pa_0002.jp2 = page 2, in other manuscripts you’ll see for example fr_0003r.jp2), so it’s simple enough to use Automator or another tool to batch rename the files by removing all the other bits and just leaving the shelfmark and folio or page number. 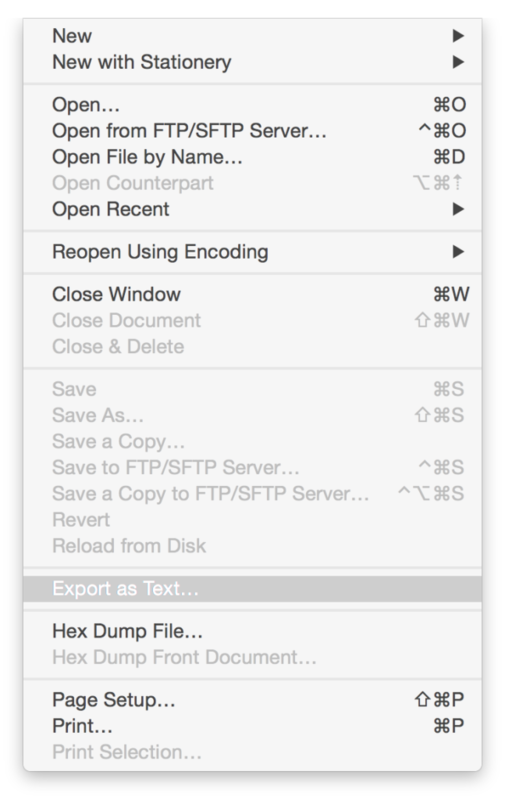 There are other ways you could do this, too, using Excel to construct the URLs and wget to download, but I think the method outlined here is relatively simple for people who don’t have strong coding skills. Don’t hesitate to ask if you have trouble or questions about this! 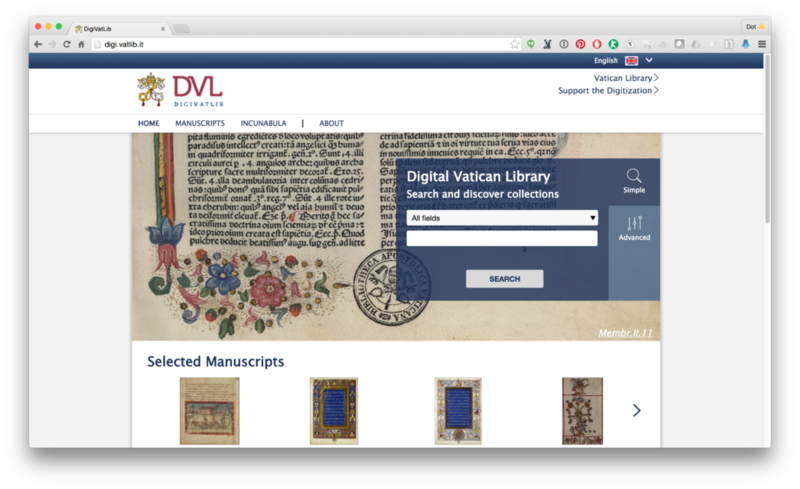 And please remember that the Vatican manuscript images are not licensed for reuse, so only download them for your own scholarly work. 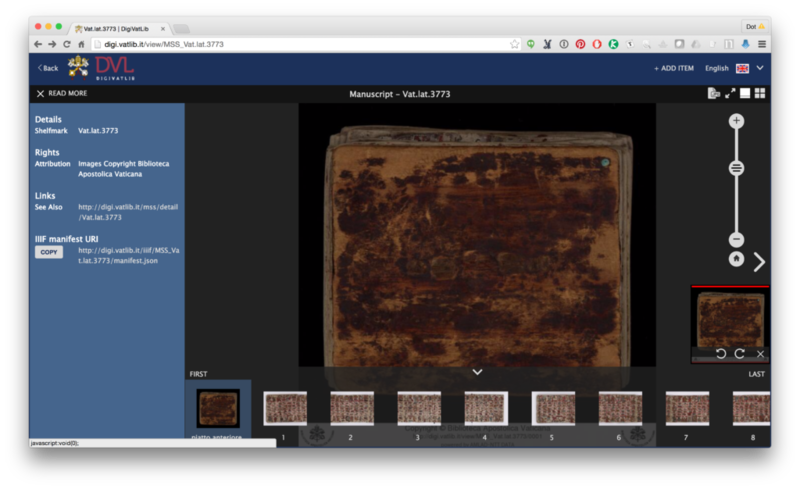 IIIF manifests are great, but what if you want to work with digital images outside of a IIIF interface? 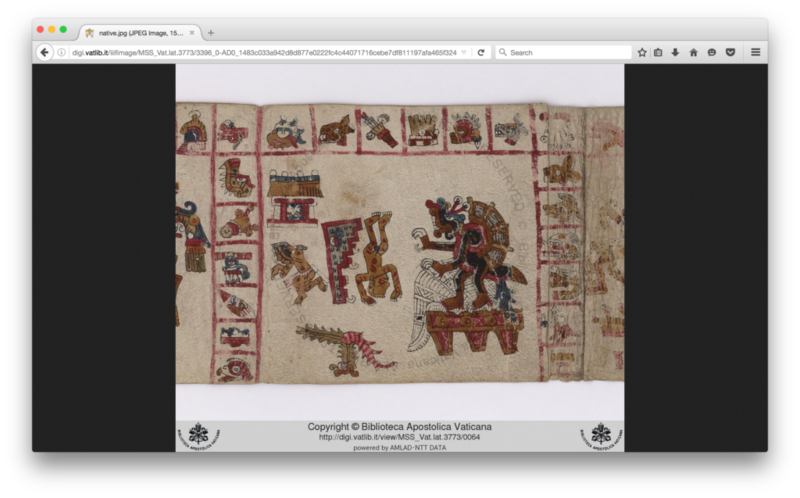 There are a few different ways I’ve figured out that I can use IIIF manifests to download all the images from a manuscript. The exact approach will vary since different institutions construct their image URLs in different ways. Here’s the first approach, which is fairly straightforward and uses e-codices as an example. Tomorrow I’ll post a second post using on the Vatican Digital Library. Please remember that most institutions license their images, so don’t repost or publish images unless the institution specifically allows this in their license. 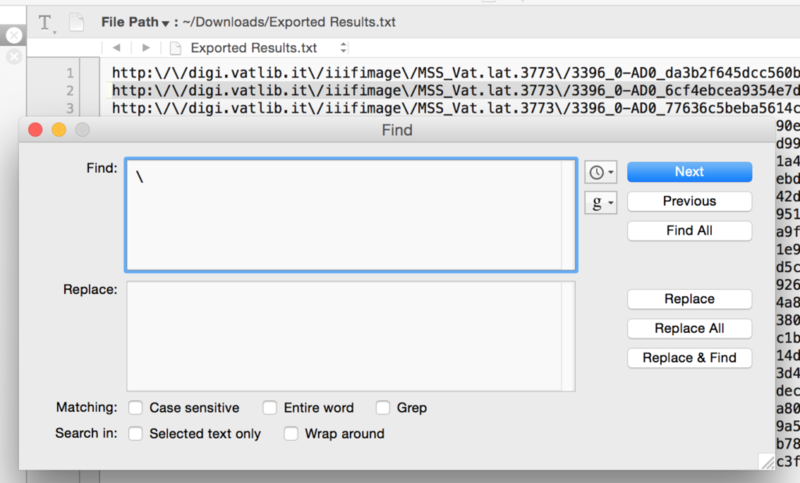 This is the easiest method, but it only works if the manifest contains urls that resolve directly to image files. If you can copy a url and paste it into a browser and an image displays, you can use this method. The manifests provided by e-codices follow this approach. 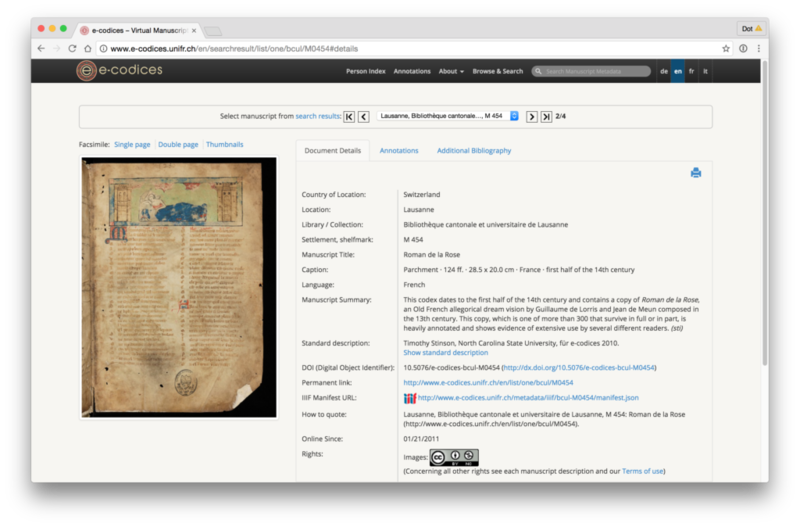 Go to e-codices, search for a manuscript, and click the “IIIF manifest” link on the Overview page. The manifest will open in the browser. It will look like a mess, but it doesn’t need to look good. Now, we only want the images that are named “default.jpg”. These are the “regular” jpeg files; the .jp2 files are the masters and, although you could download them, your browser wouldn’t know what to do with them. So we need to create a new filter so we get only the default.jpg files. To do this, first click “Preferences” in the lower right-hand corner, then click the “Filters” button in the resulting window. There they are. To create a new filter, click the “Add New Filter” button, and call the new filter “Default Jpg” (or whatever you like). 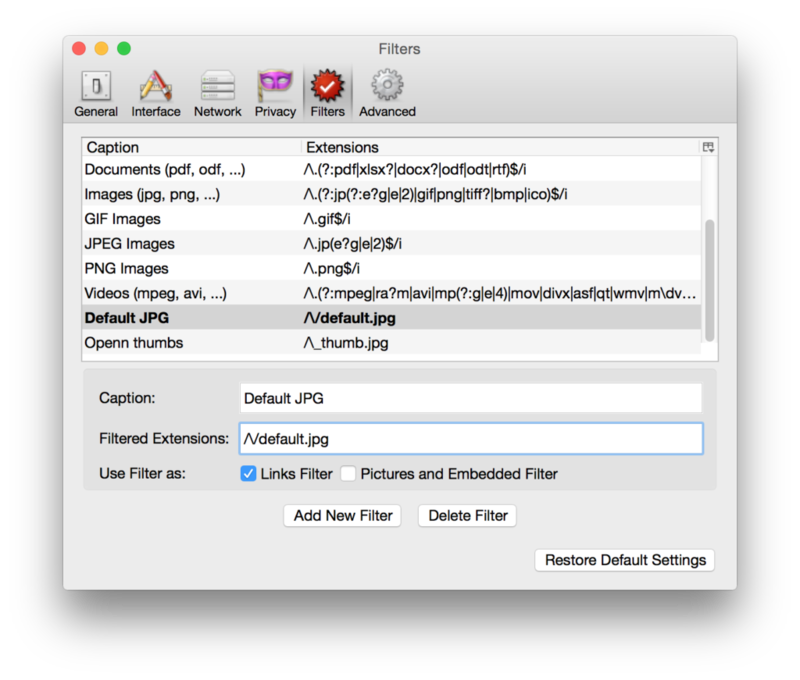 In the Filtered Extensions field, type “/\/default.jpg” – the filter will select only those files that end with “default.jpg” (yes you do need three slashes there!). Note that you do not need to press save or anything, the filter list updates and saves automatically. Return to the main Down Them All view and check the box next to your newly-created filter. 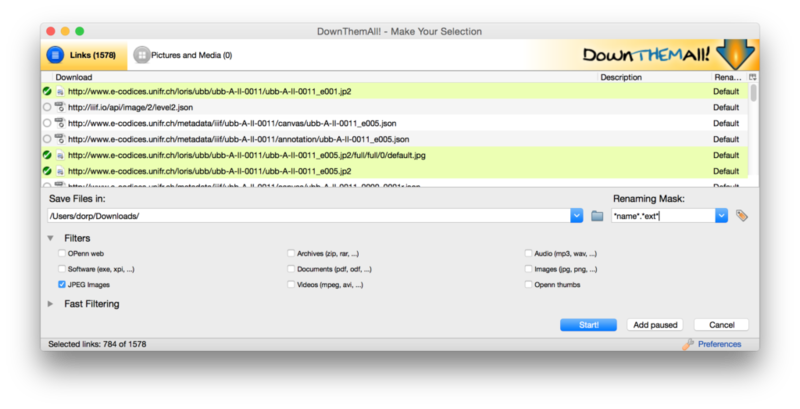 Be amazed as all the “default.jpg” files are highlighted. Don’t hit download just yet. If you do, it will download all the files with their given names, and since they are all named “default.jpg” it won’t end well. It will also download them all directly to whatever is specified under “Save Files in” (in my case, my Downloads folder) which also may not be ideal. So you need to change the Renaming Mask to at least give you unique names for each one, and specify where to download all those files. In the case of e-codices the manifest urls include both the manuscript shelfmark and the folio number for each image, so let’s use the Renaming Mask to name the files according to the file page. Simply change *name* to *flatsubdirs* (flat subdirectories). 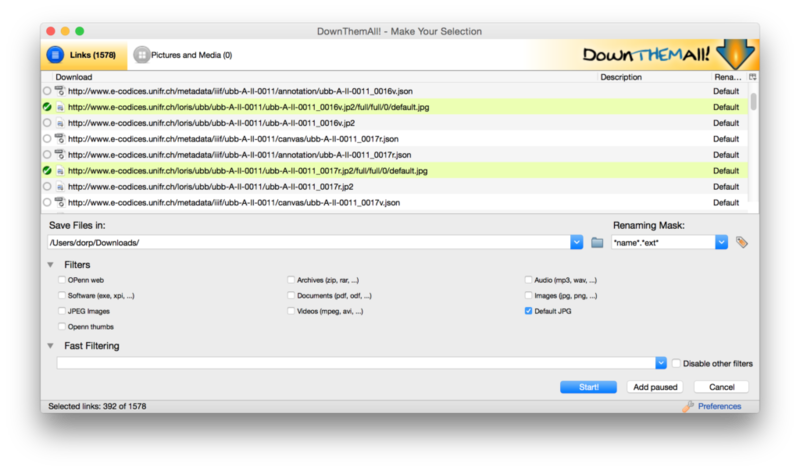 Under “Save Files in”, browse to wherever you want to download all these files. Press “Start” and wait for everything to download. Congratulations, you have downloaded all the images from this manuscript! 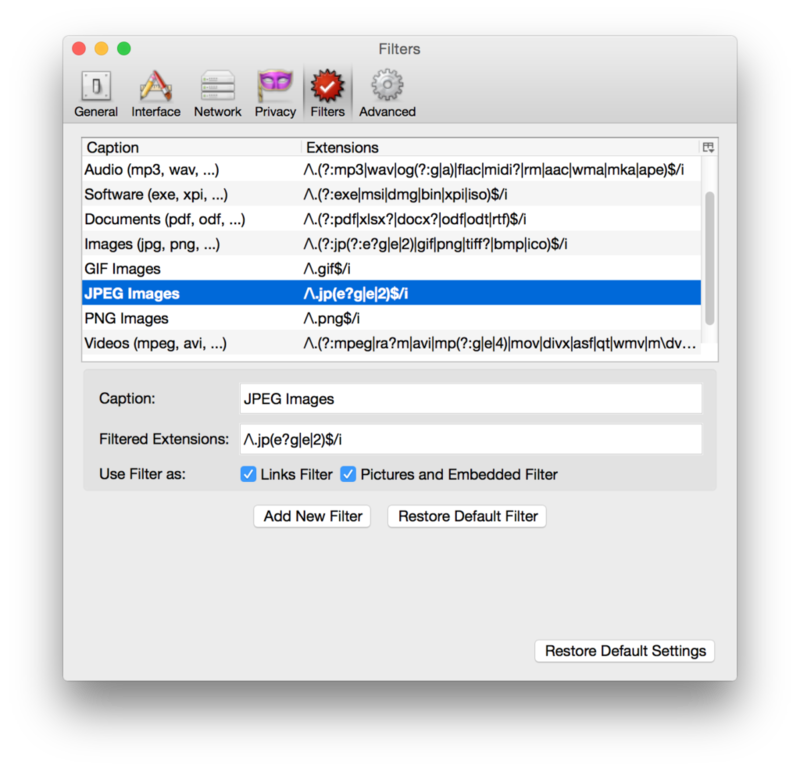 You’ll probably want to rename them (if you’re on Mac you can use Automator to do this fairly easily), and you should also save the manifest alongside the images.